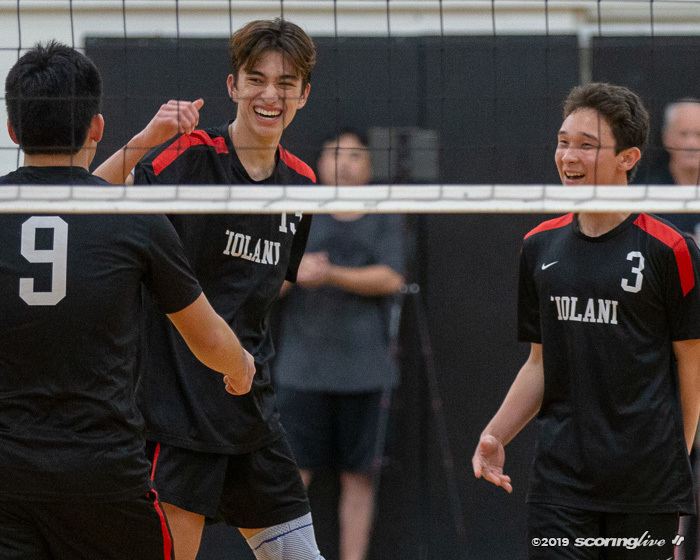 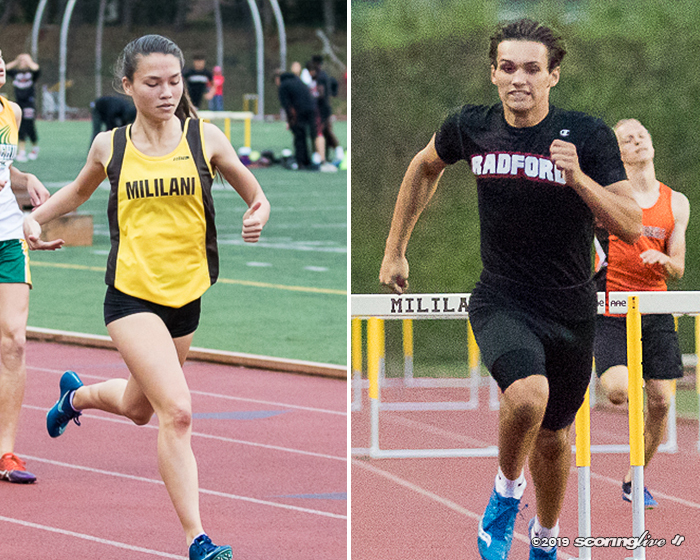 HALAWA — The Marauders' roller coaster season culminates with a league title. No. 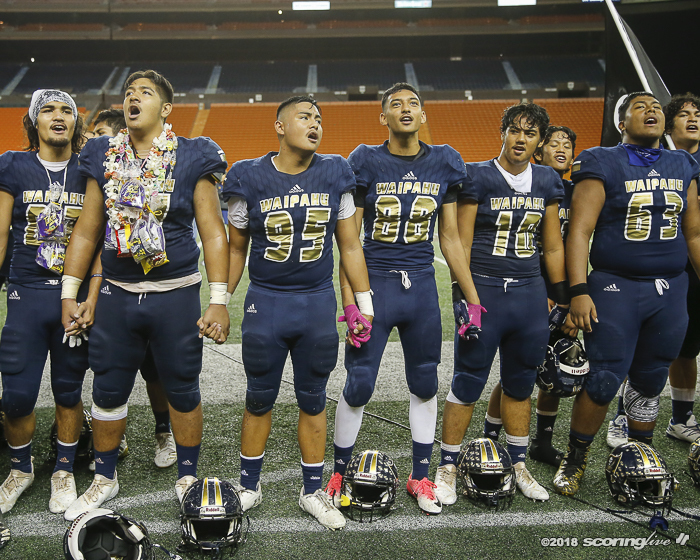 11 Waipahu overwhelmed No. 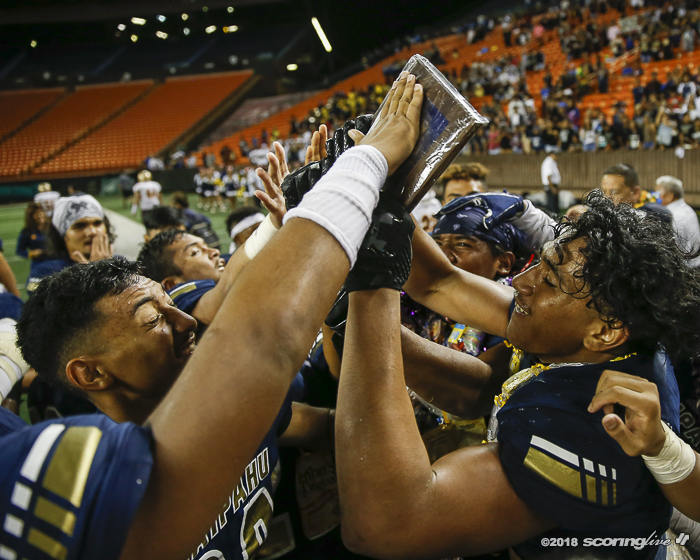 15 Castle, 32-3, to capture the Oahu Interscholastic Association Division I title at Hawaiian Financial FCU Field at Aloha Stadium Friday night. 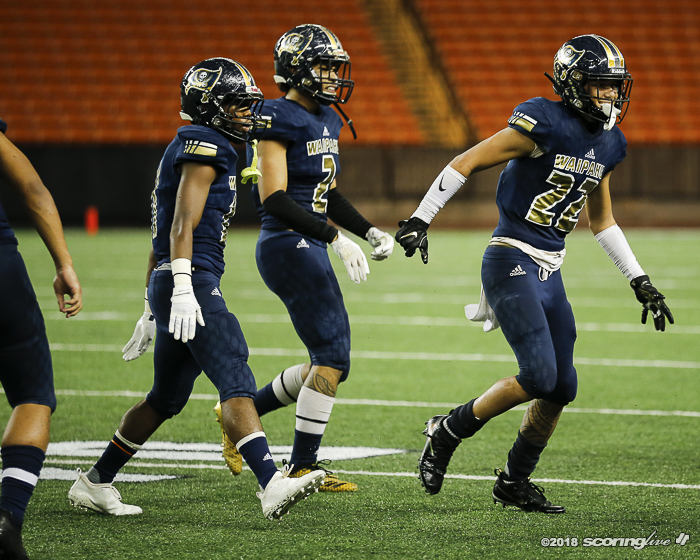 After being promoted to Division I this season, the Marauders (7-4 overall, 6-2 OIA) won their 12th overall OIA title, and in the process clinched the league's only berth to the First Hawaiian Bank/HHSAA Football State Championships starting on Friday, Nov. 9. 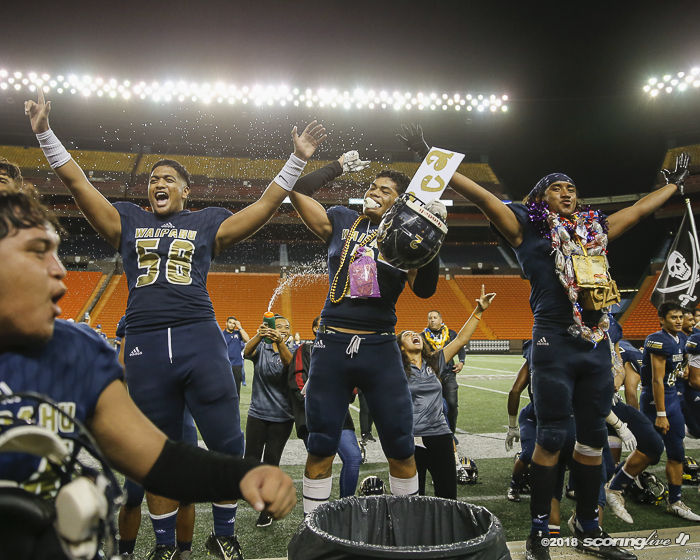 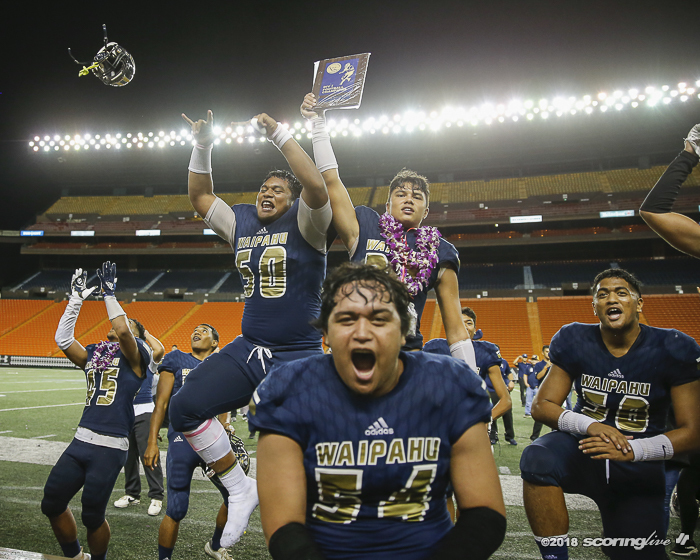 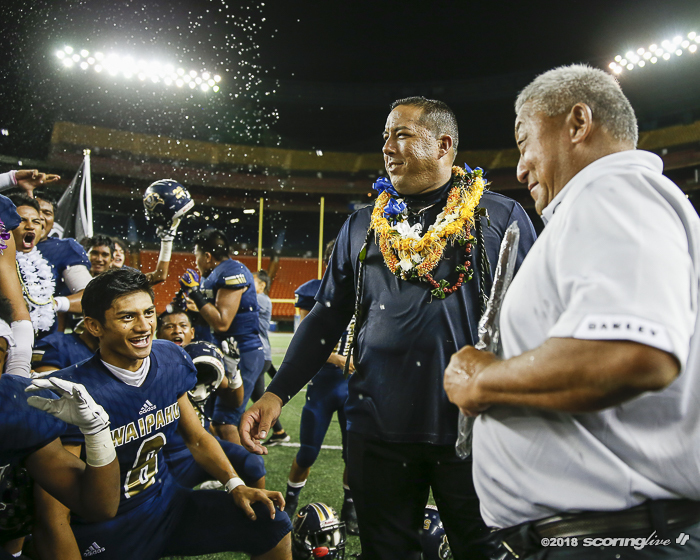 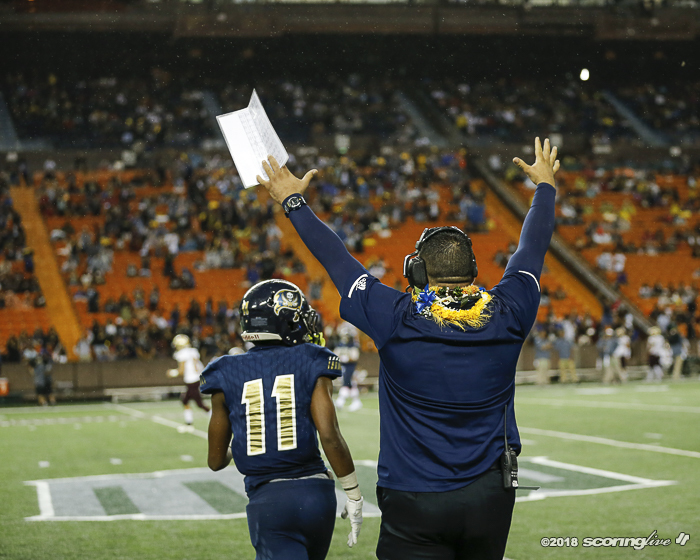 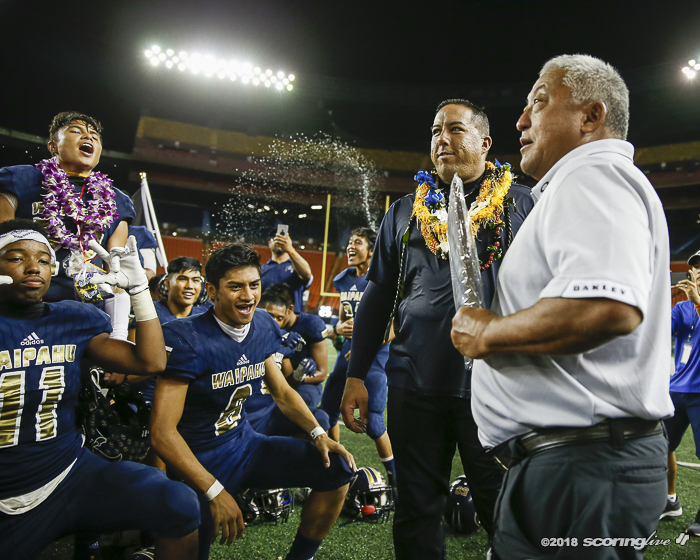 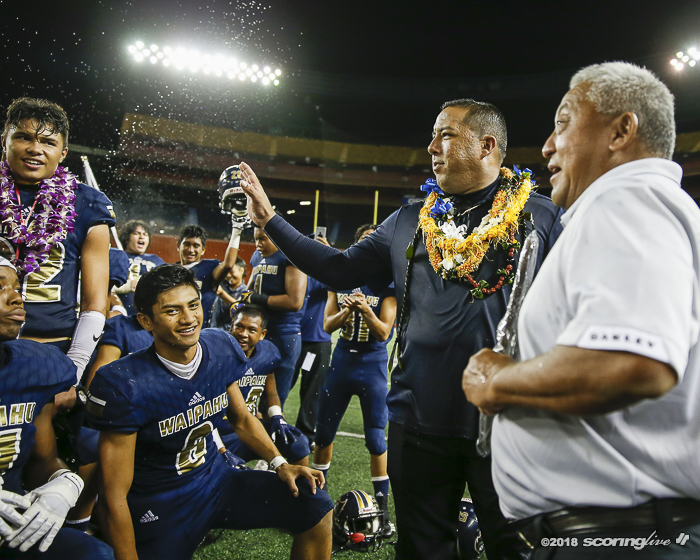 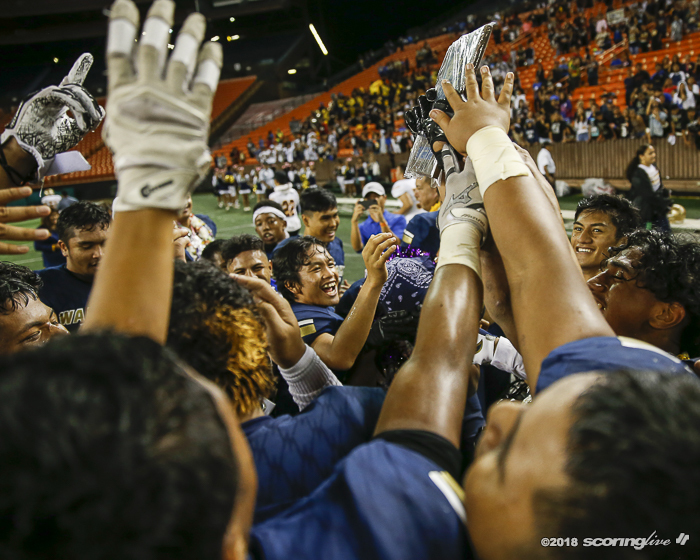 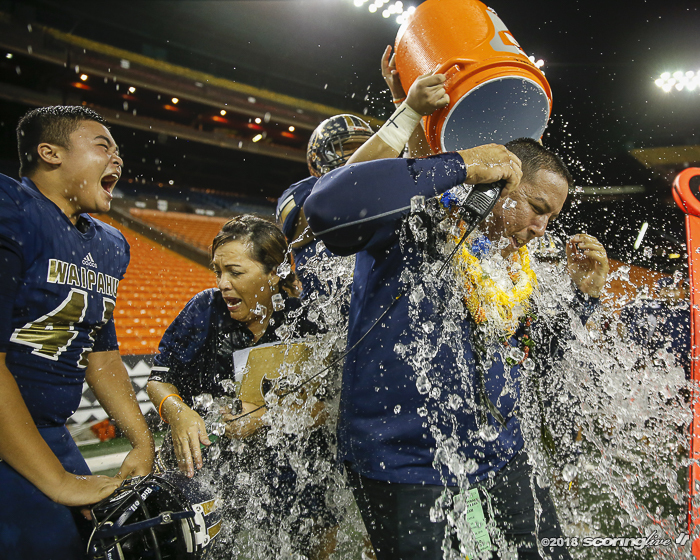 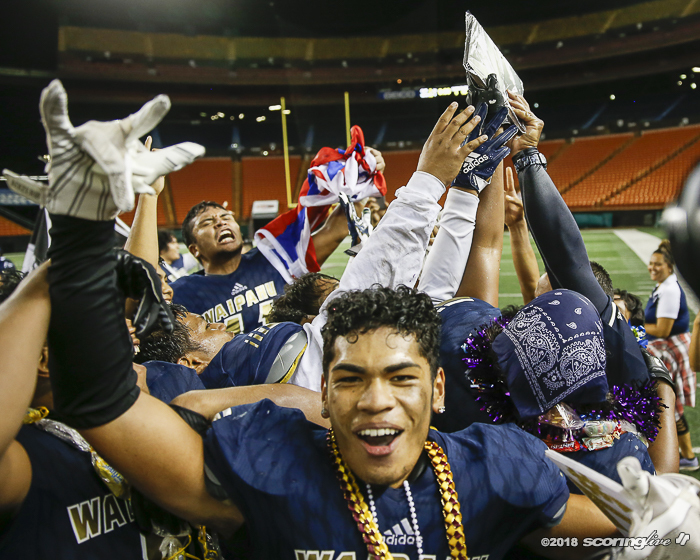 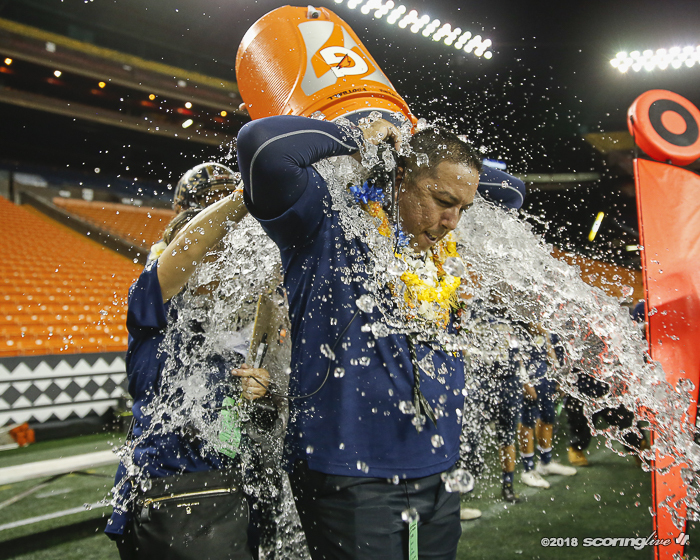 "This is what we worked so hard for," Waipahu coach Bryson Carvalho said. 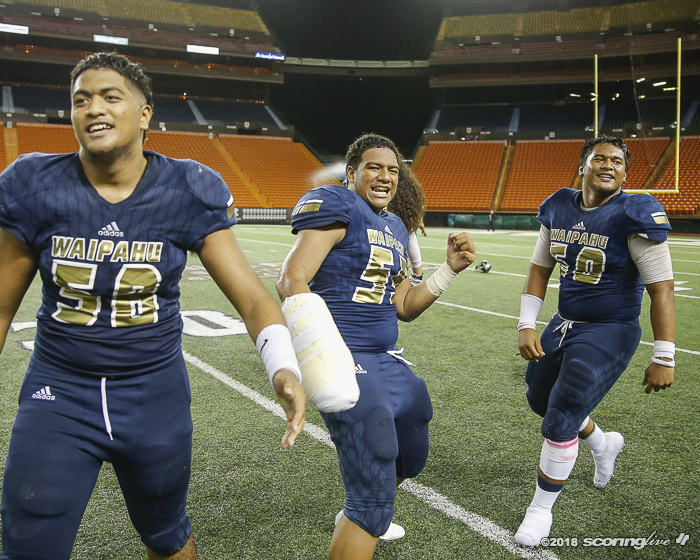 "They were able to pull through and staying committed and this is the result." 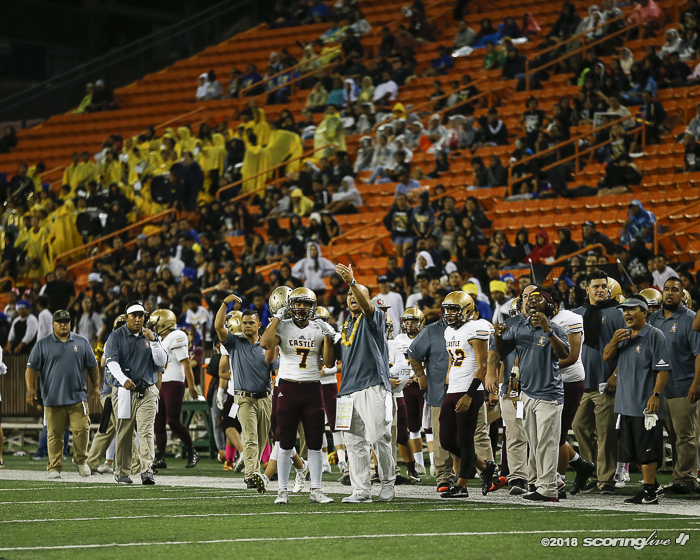 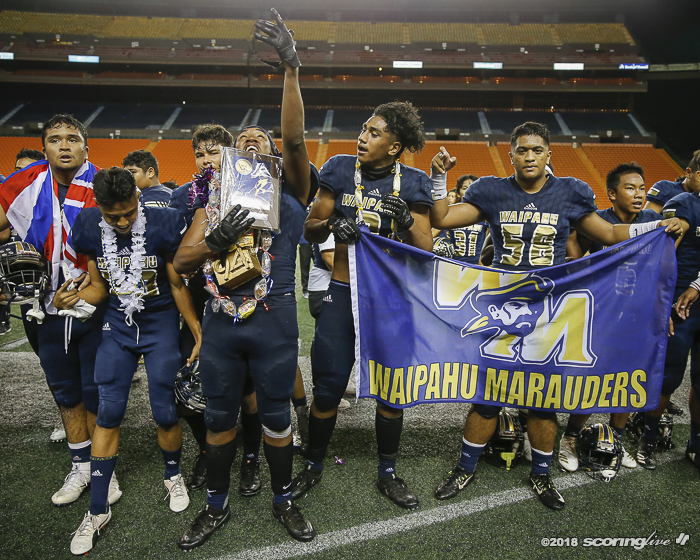 The Marauders won the Division II OIA championship the previous season and built on that success at the next level. 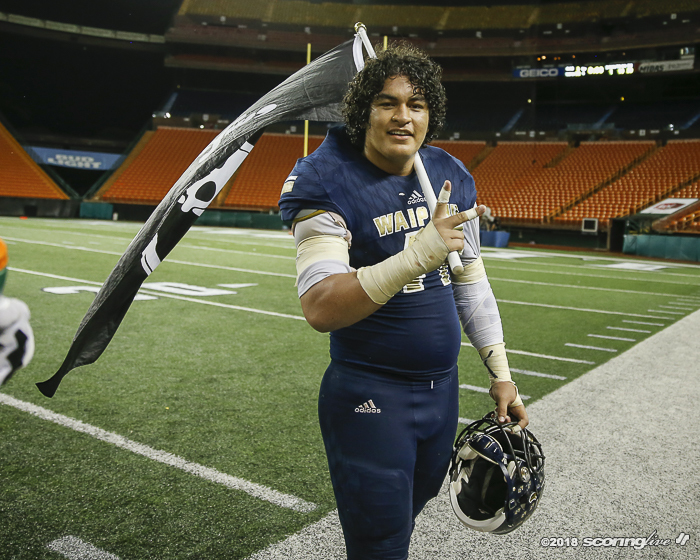 "It's amazing coming out here to see the fans. 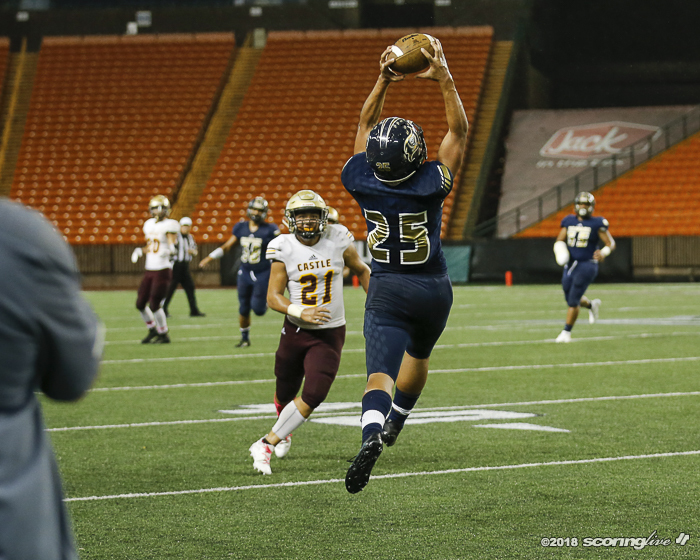 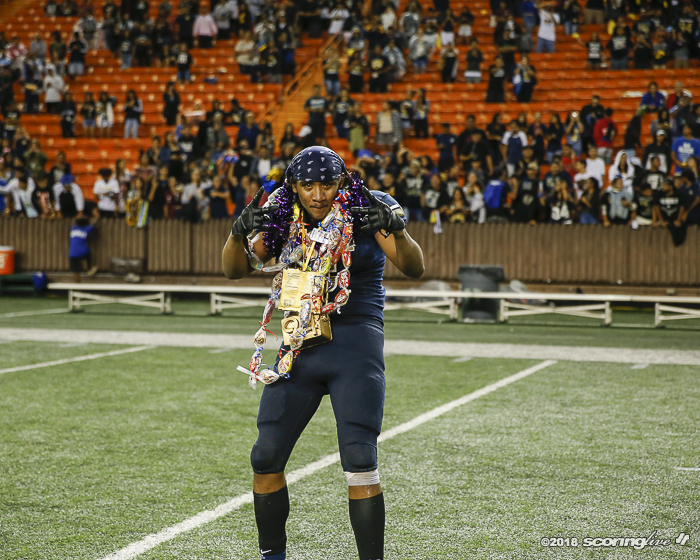 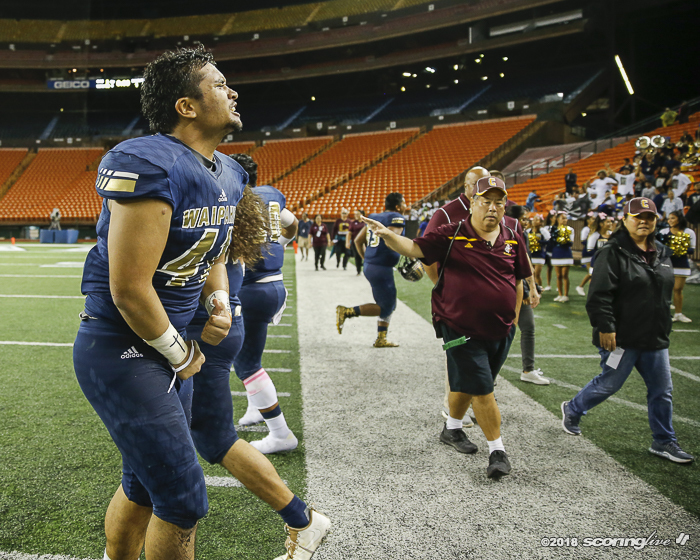 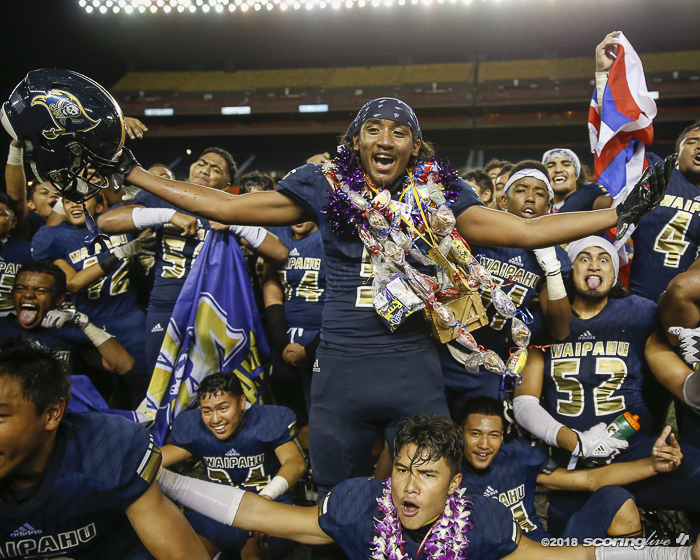 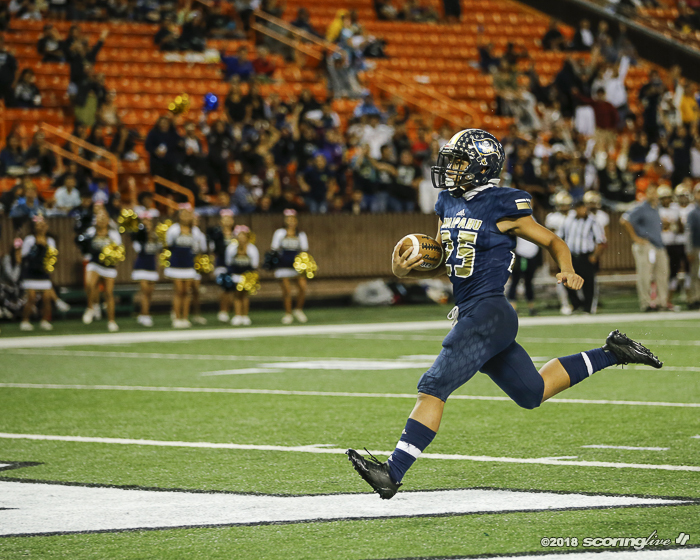 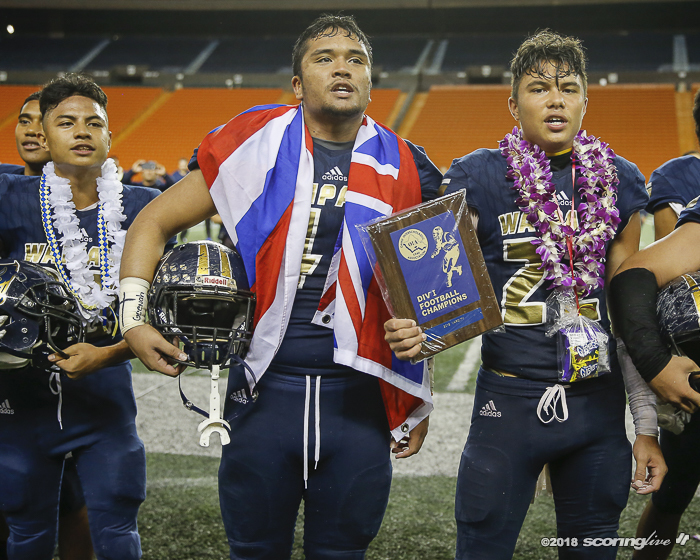 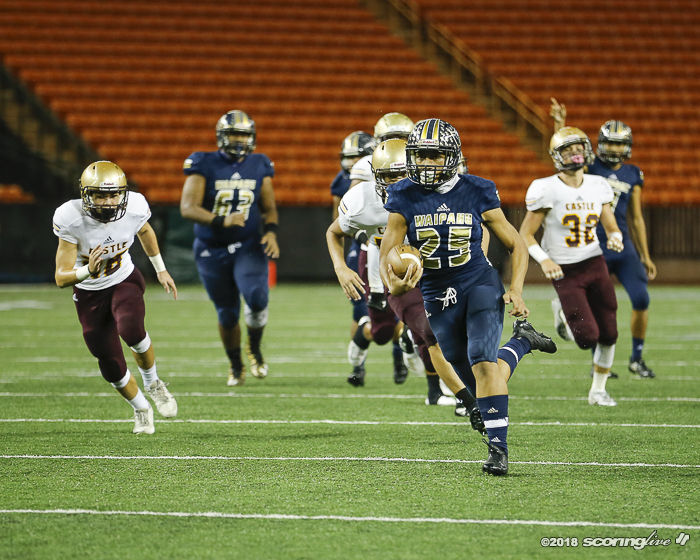 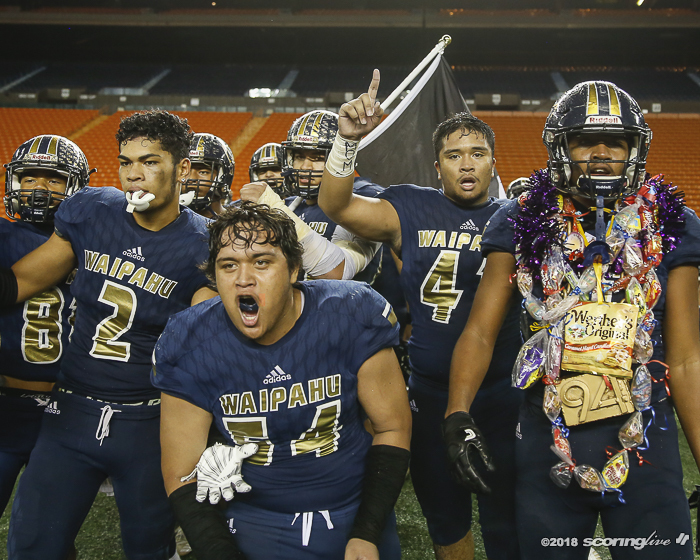 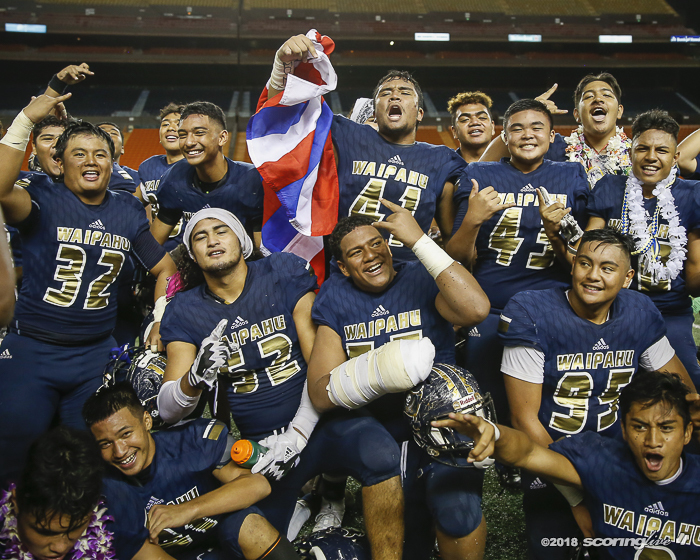 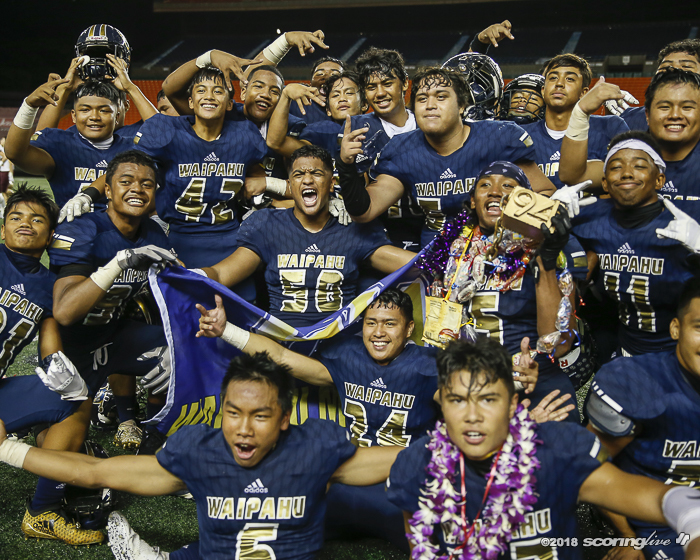 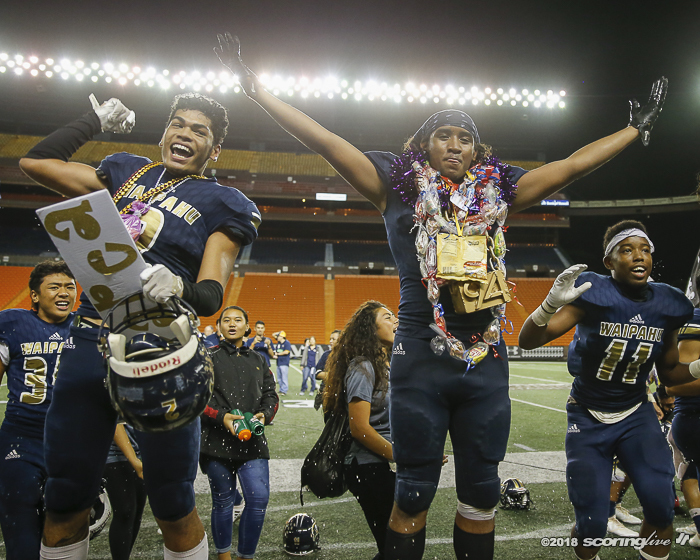 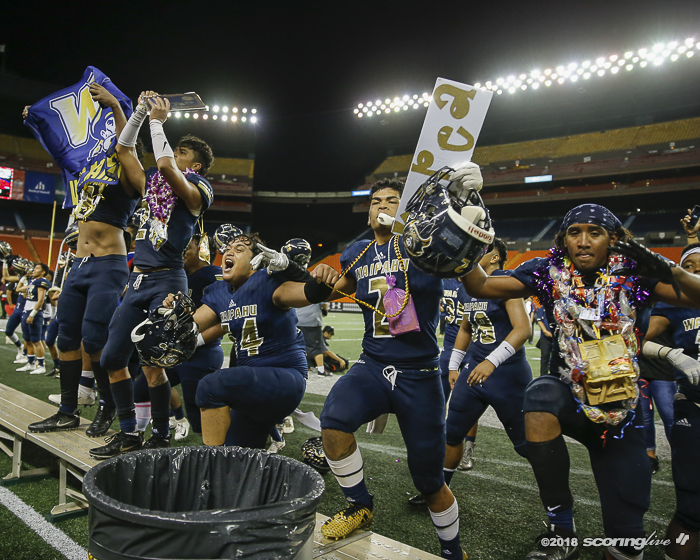 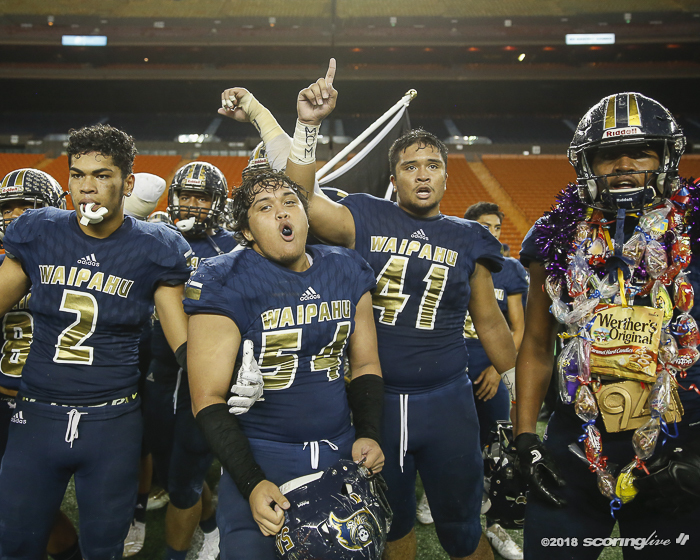 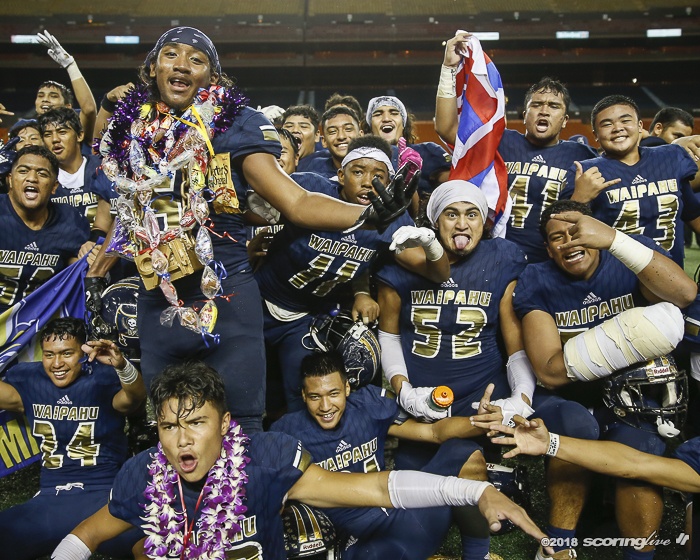 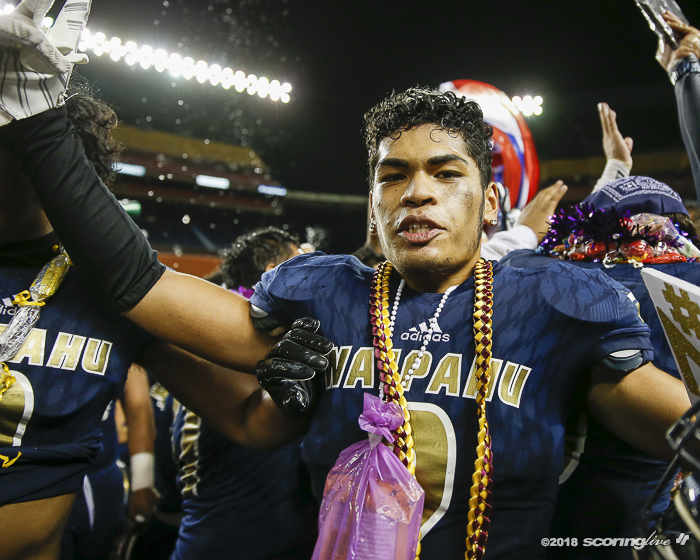 Coming together as a team and it means a lot coming from D2 and coming up with the Division I championship," Waipahu running back Alfred Failauga said. 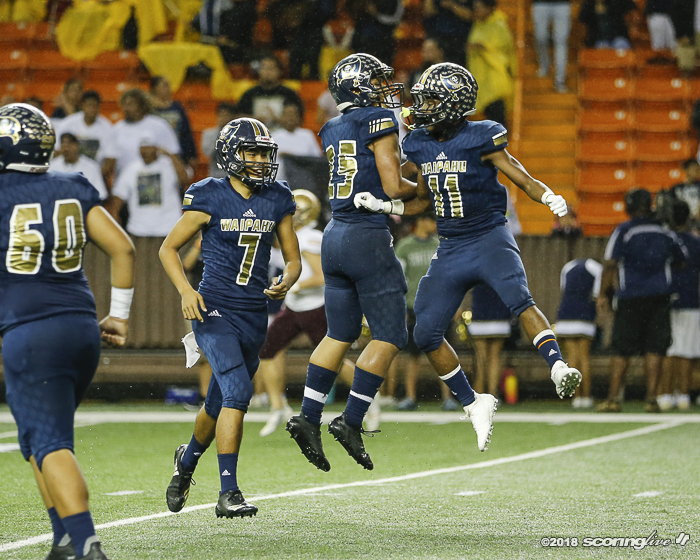 The Knights overcame a 0-4 start early in the season but won five of their next seven games, and on the way, upset top-seeded Moanalua, 28-14, to reach the title game. 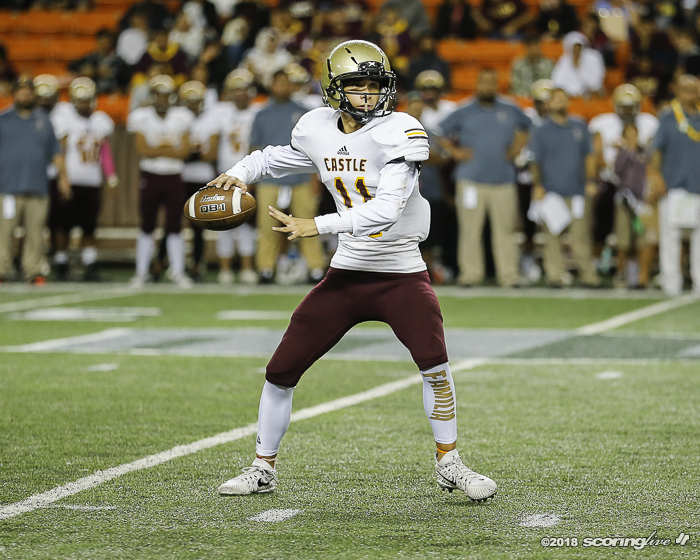 The Cinderella playoff run ended as Castle wrapped up their season at 5-7 overall, 5-4 OIA. 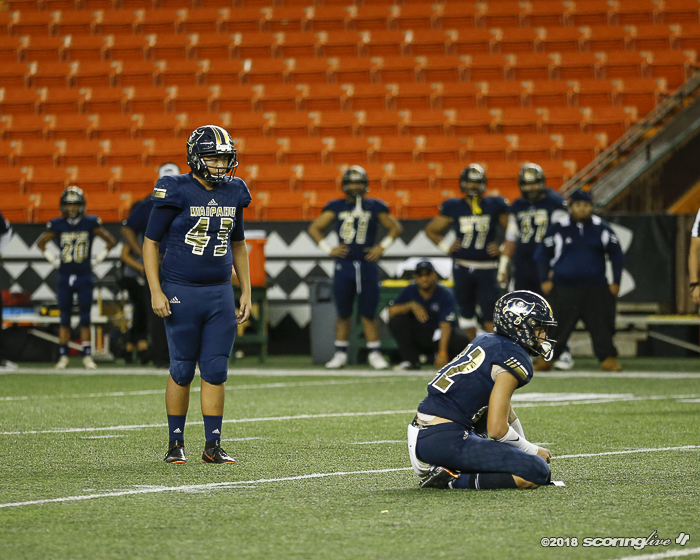 "It's a tough loss. 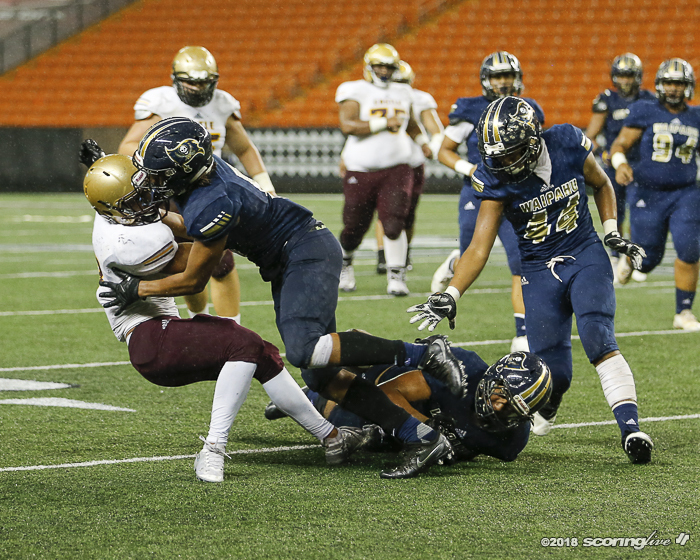 It's a tough one to swallow, but it came down to execution. 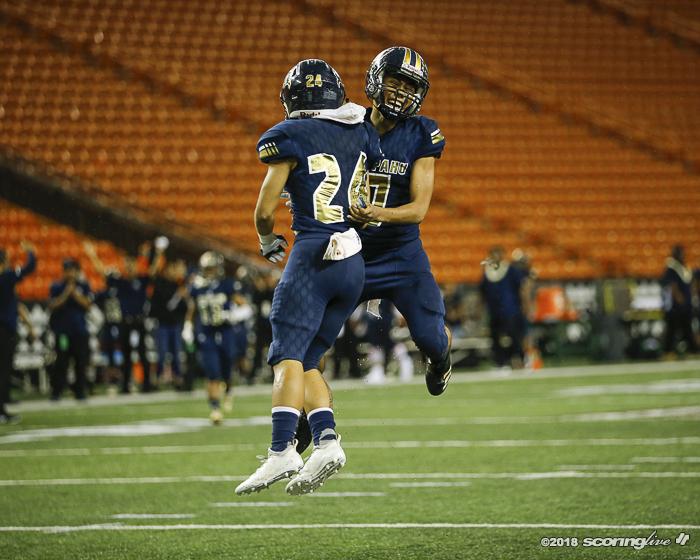 I'm happy we're in the championship game. 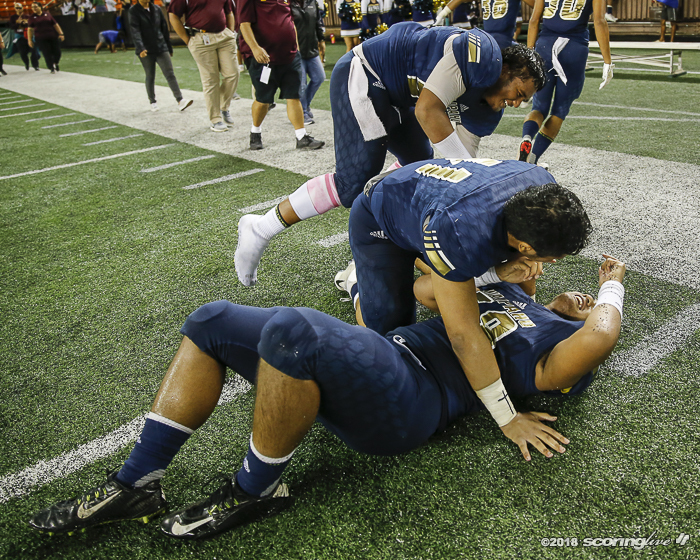 The community is, the families and players are. 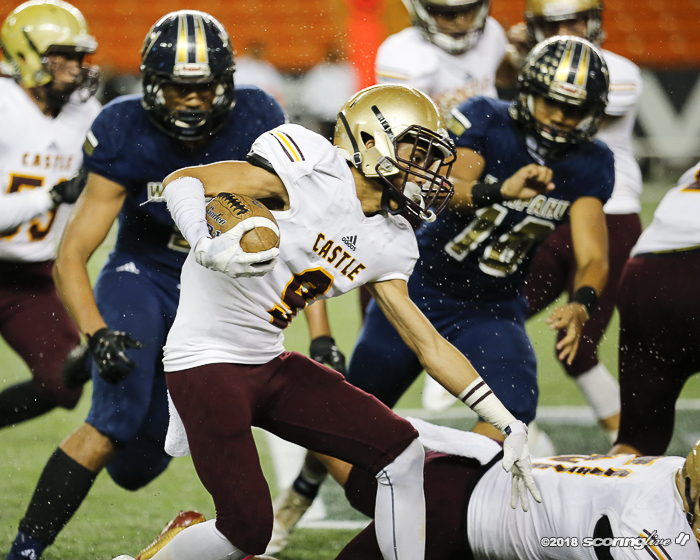 It's a matter of us guys getting back to the drawing board and have them learn it and understand it so they can execute it on the field," Castle coach John Hao said of continuing to build the program. 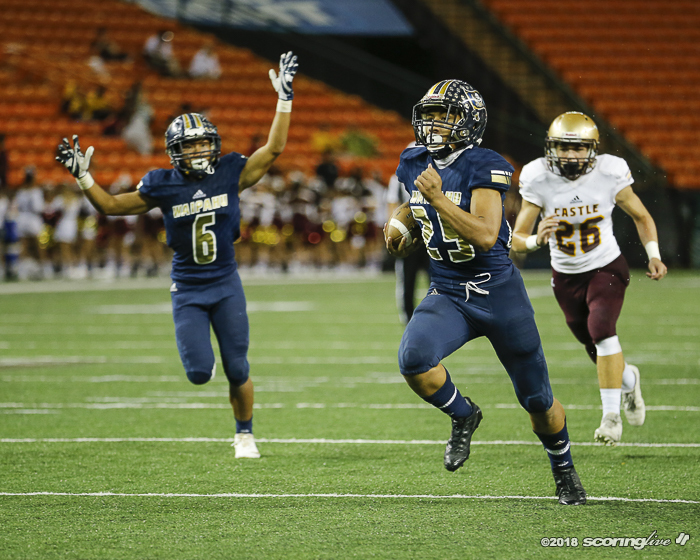 Failauga, who did not play in their Aug. 31 matchup against Castle and missed five games in the regular season, rushed for 175 yards and two touchdowns on 17 carries. 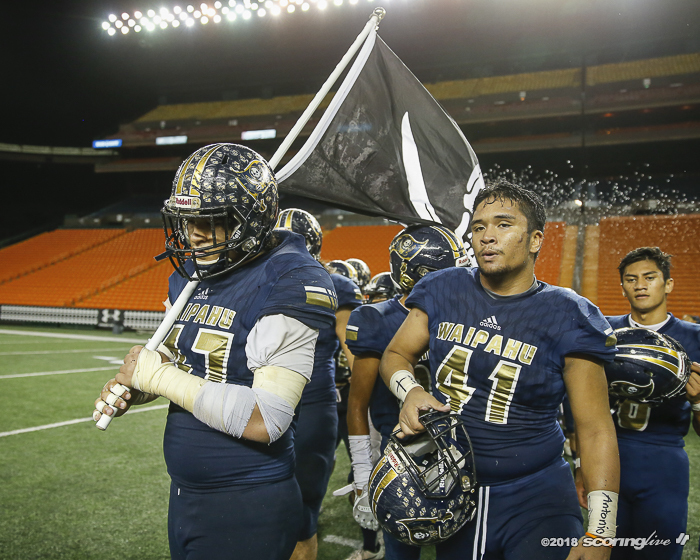 "He's our go-to guy and we're going to ride him until he can't go no more. 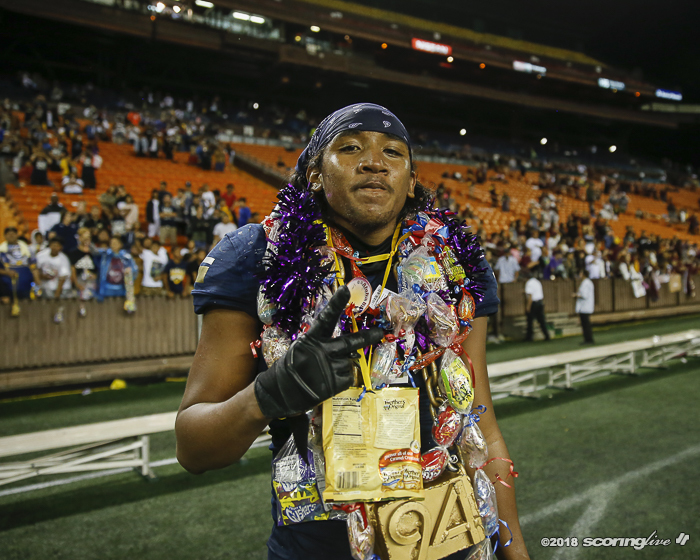 Having him back, we're very happy," Carvalho said of Failauga. 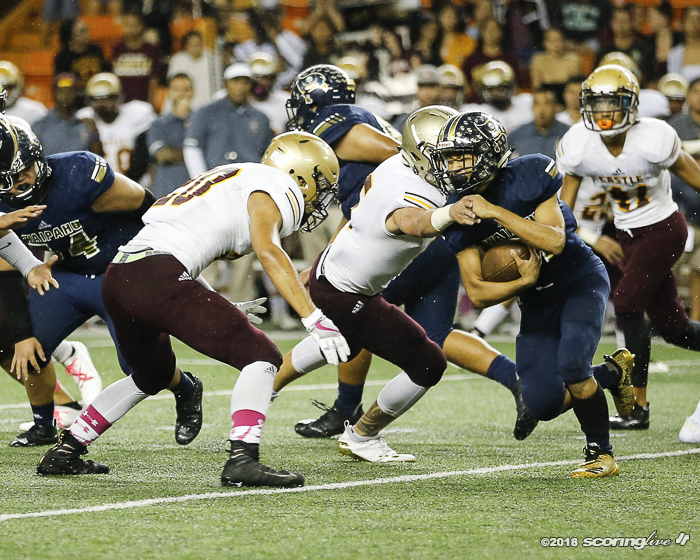 "It's another factor you have to count. 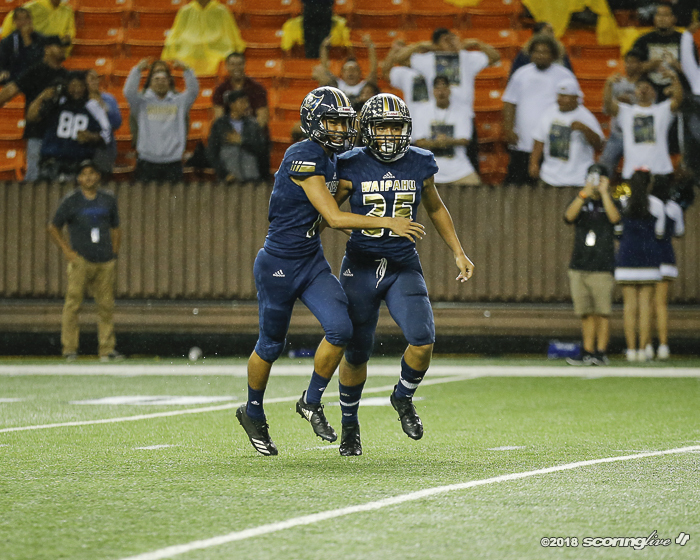 It was something we prepared for but didn't take advantage," Hao said of Failauga. 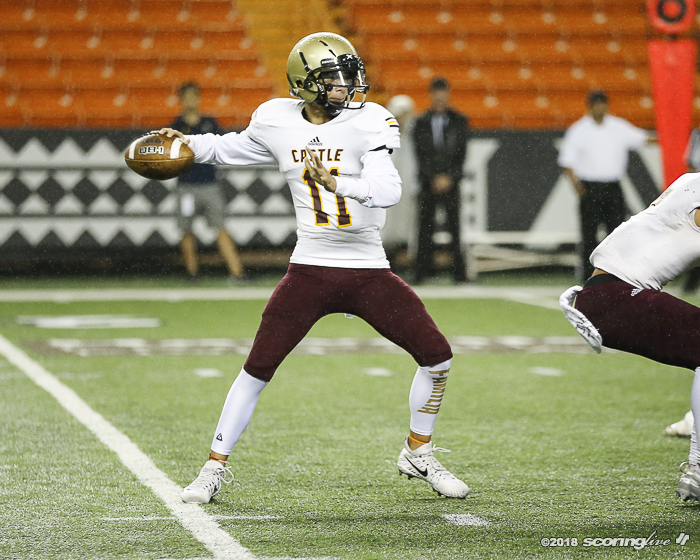 Cody Marques threw for 146 yards, two touchdowns — both to Branson Jay Reyes, who finished with three catches for 100 yards. 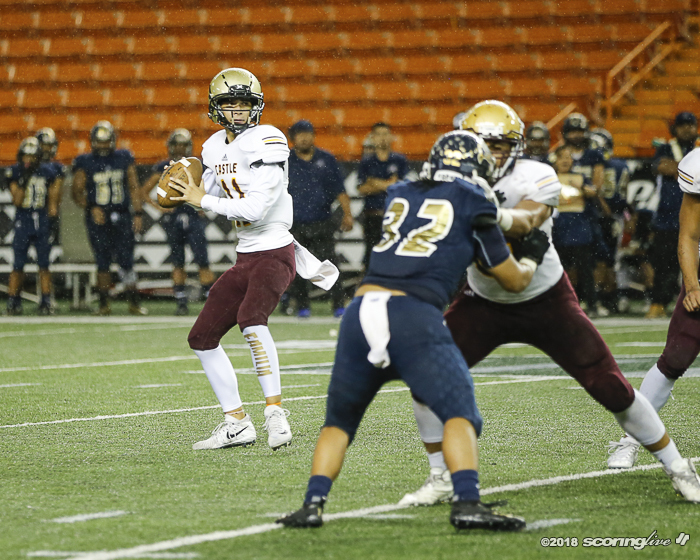 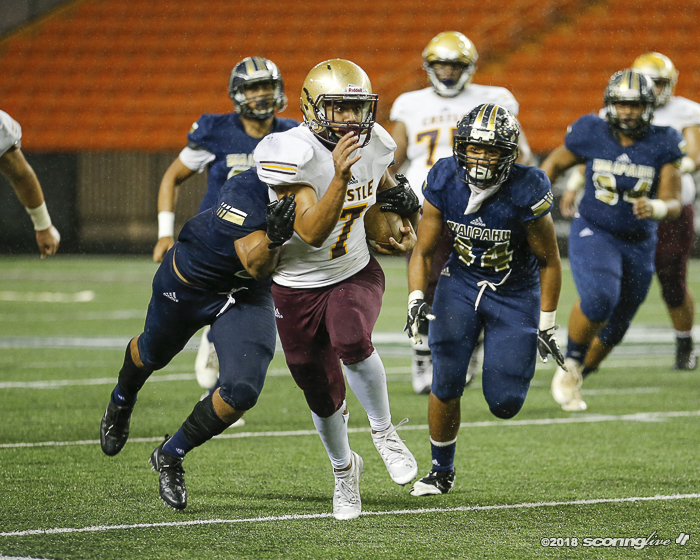 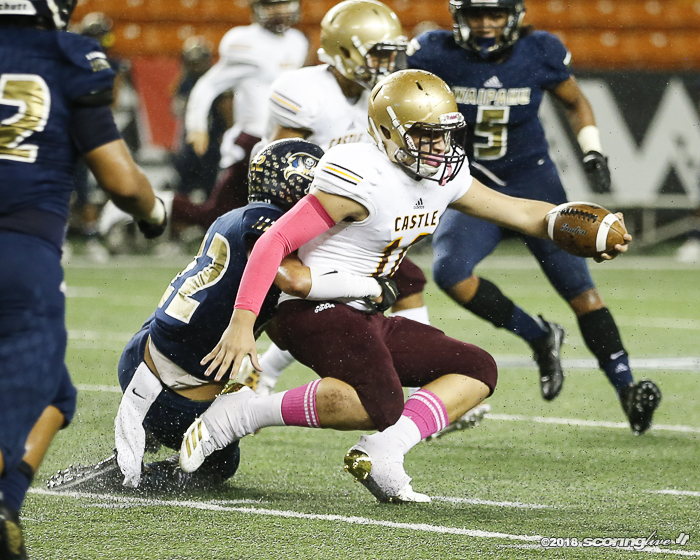 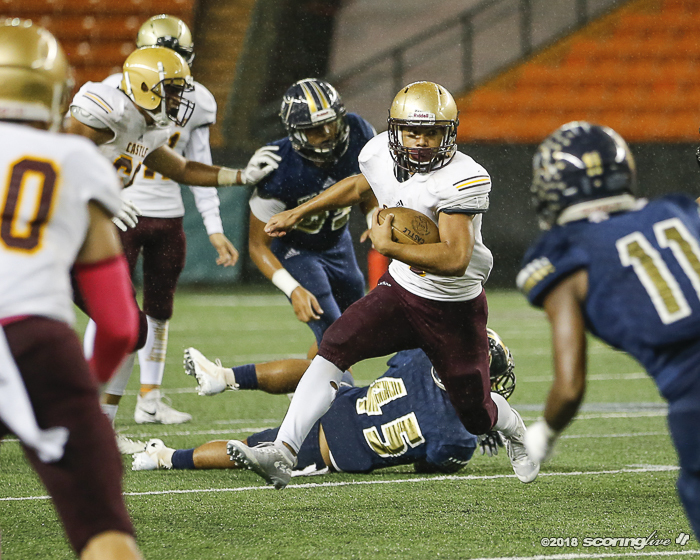 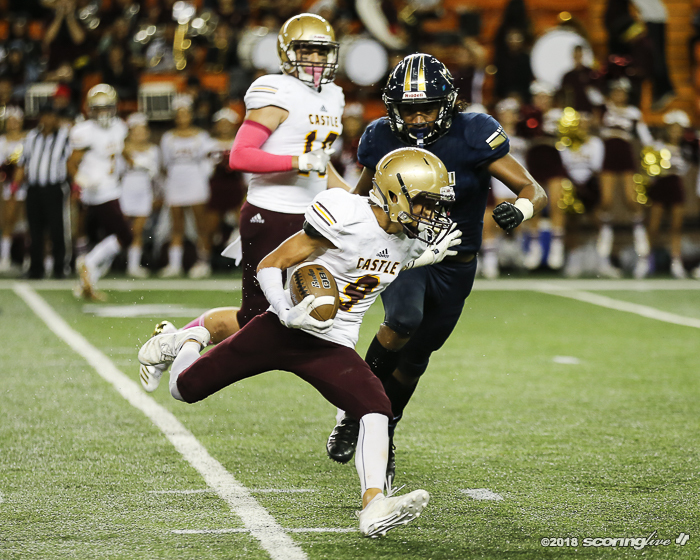 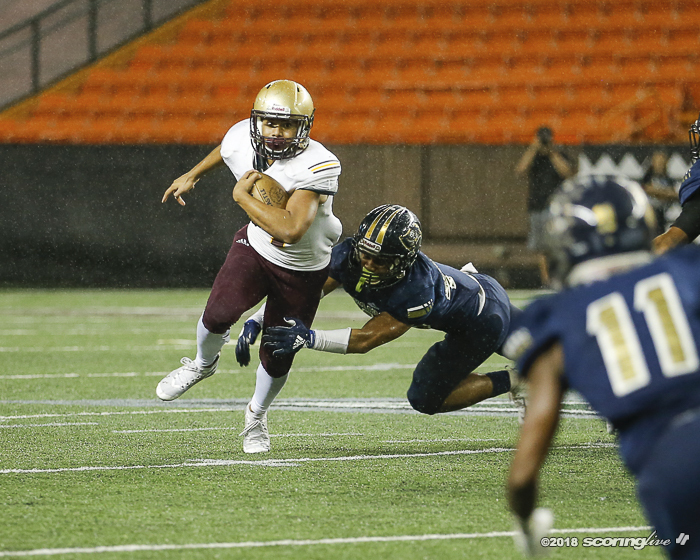 The Marauders defense did its part to bottle up Castle's offense all night as the Knights finished with 133 yards of net offense and 48 net rushing yards which was a stark contrast to their upset win over Moanalua. 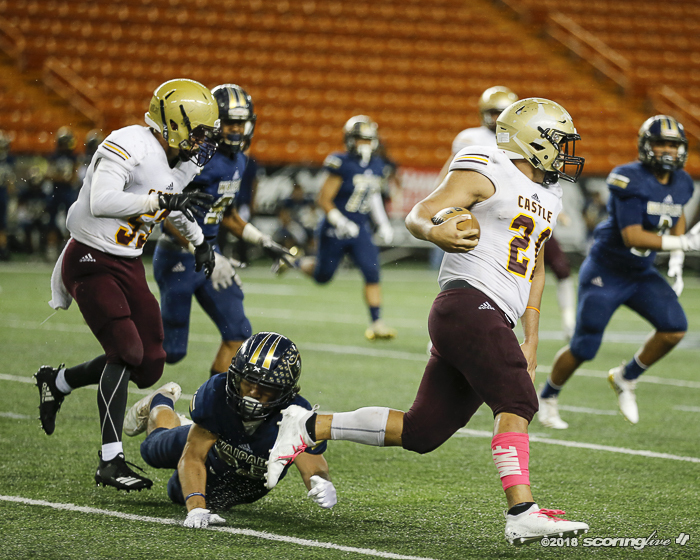 Castle put up 304 rushing yards with Tuli Punivai rushing for 247 and three touchdowns on a stout defense the previous week. 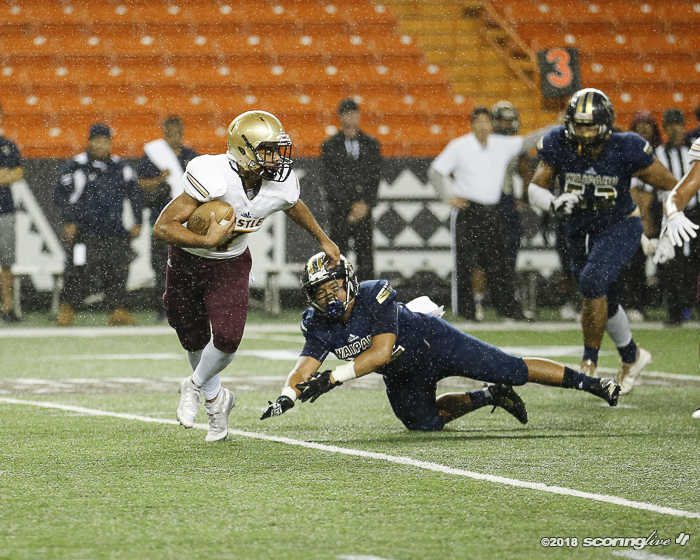 Punivai was held in check to 40 yards on 18 carries and his longest run of the night was 14 yards. 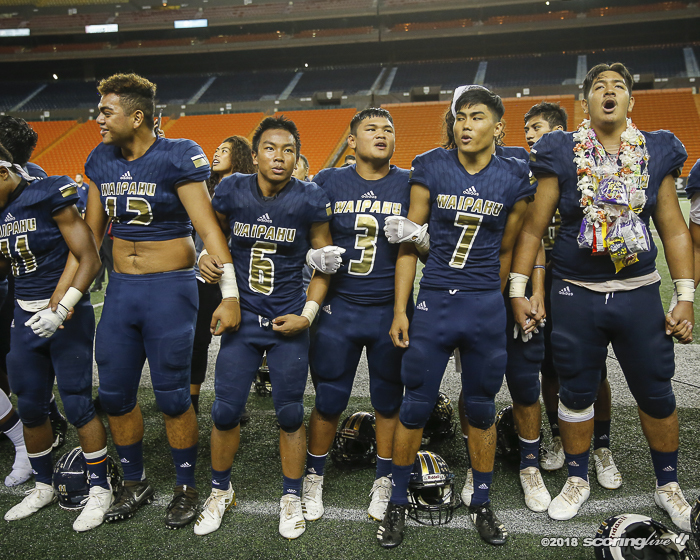 "We had to stop the elephant. 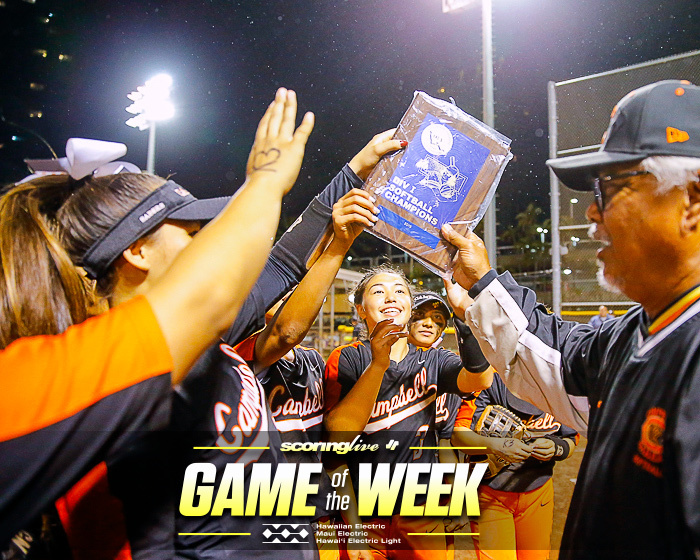 We want to make sure we stopped that based on their outing last week. 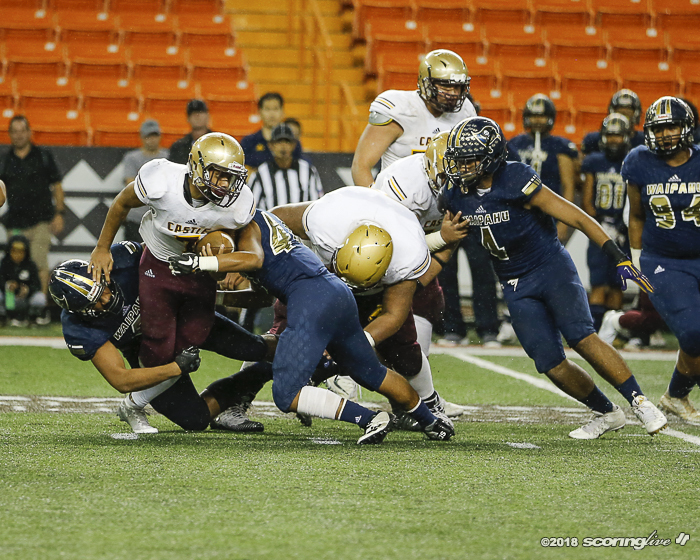 The big concern was how well they moved the football last week against Moanalua's front four. 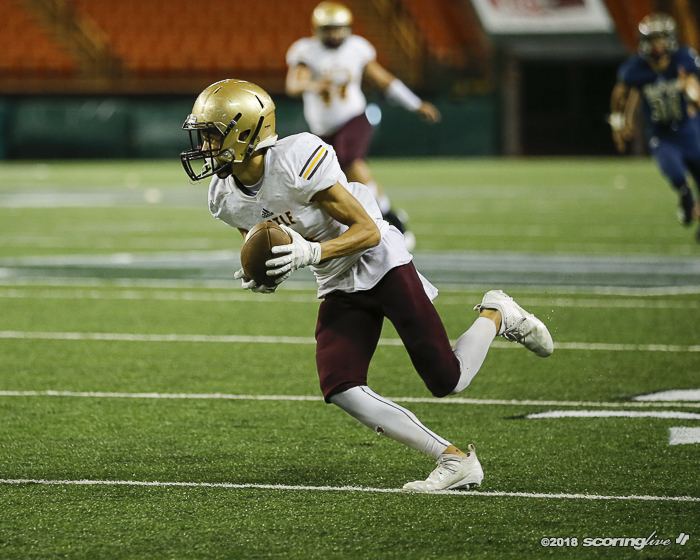 Monday's practice was boring, but we just focused on assignment and had to make sure we can stop them tonight," Carvalho said. 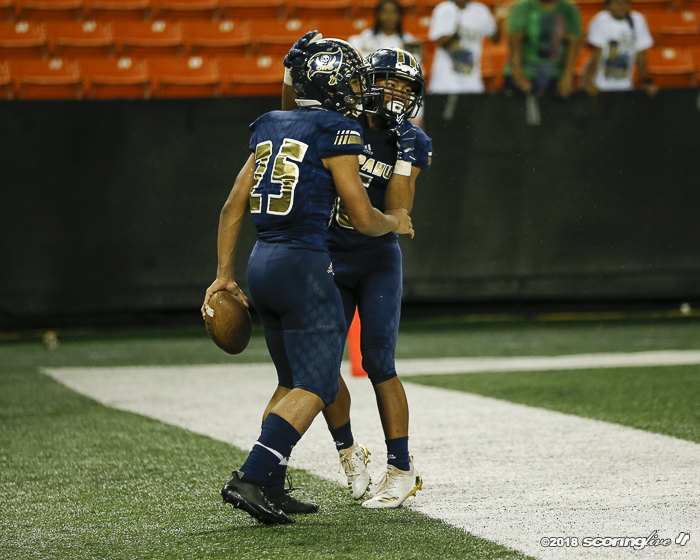 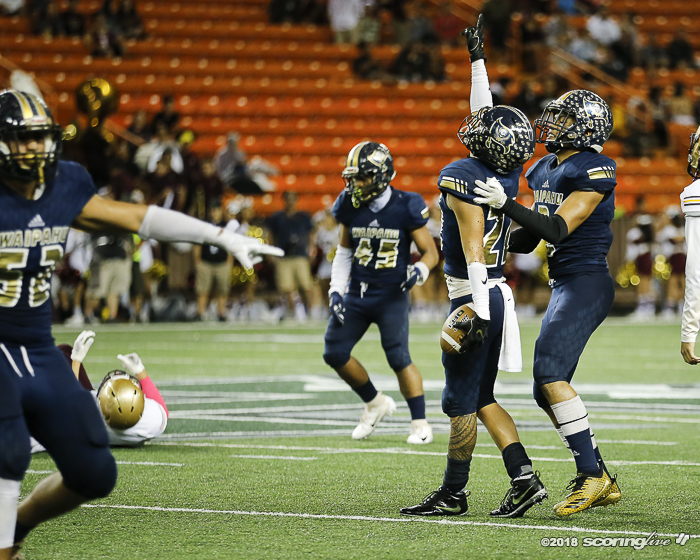 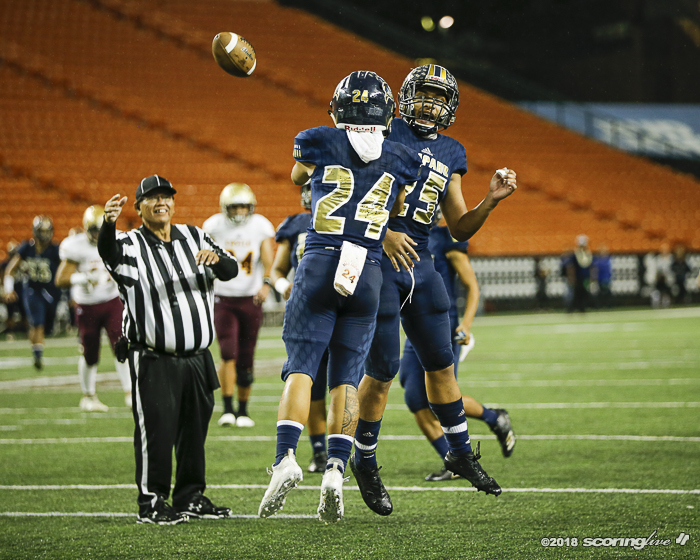 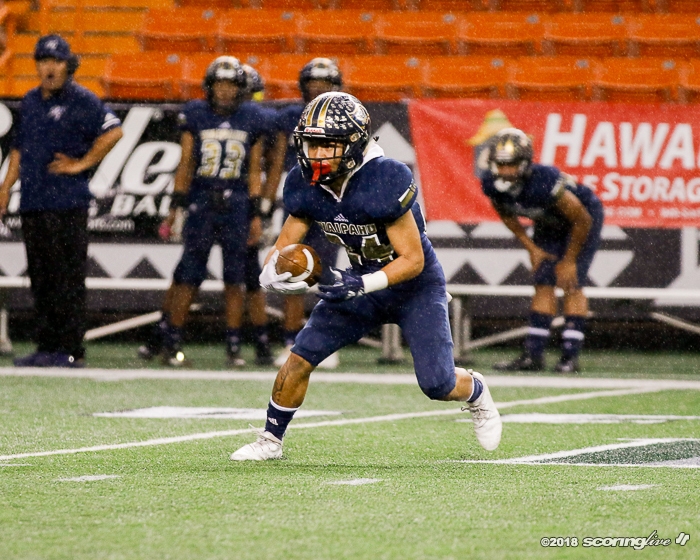 By shutting down the run and forcing the Knights to air it out, Waipahu's secondary intercepted Mana Kahoopii three times, led by Zeondre Benjamin with two and another by Tarynce Antolin. 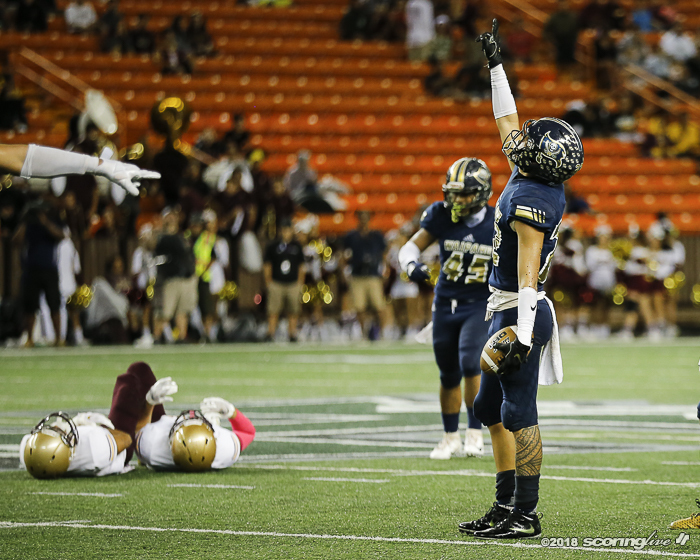 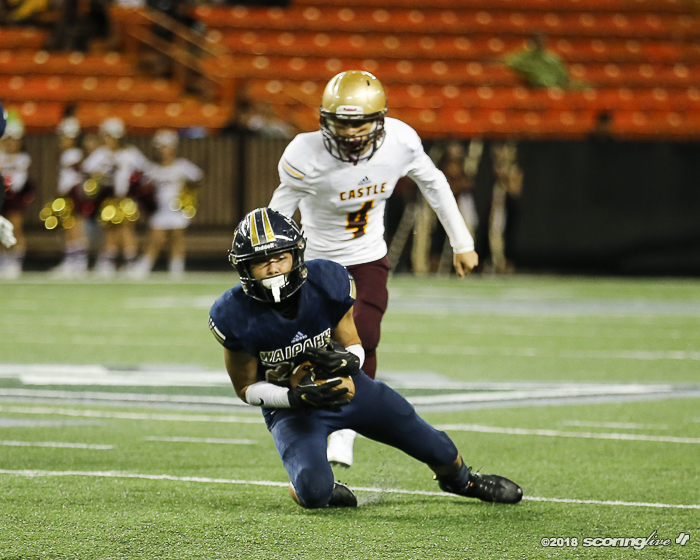 After Castle went three-and-out on their opening drive, Waipahu got on the board four plays later as Marques found Reyes up the middle and took it 69 yards. 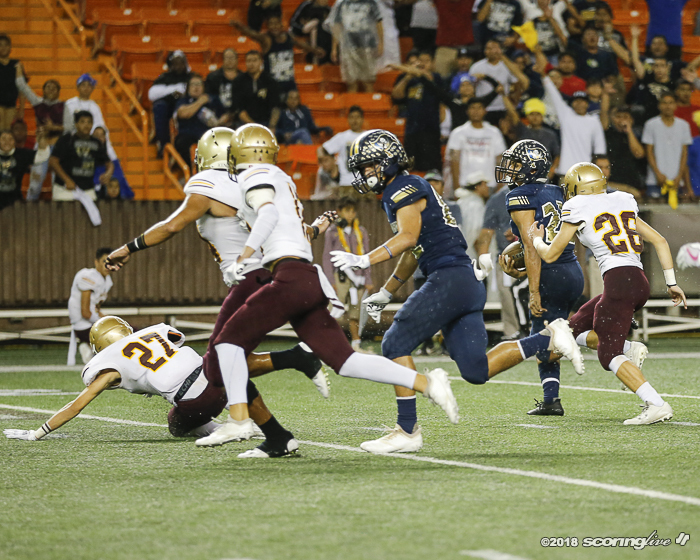 The kick was blocked for a 6-0 lead. 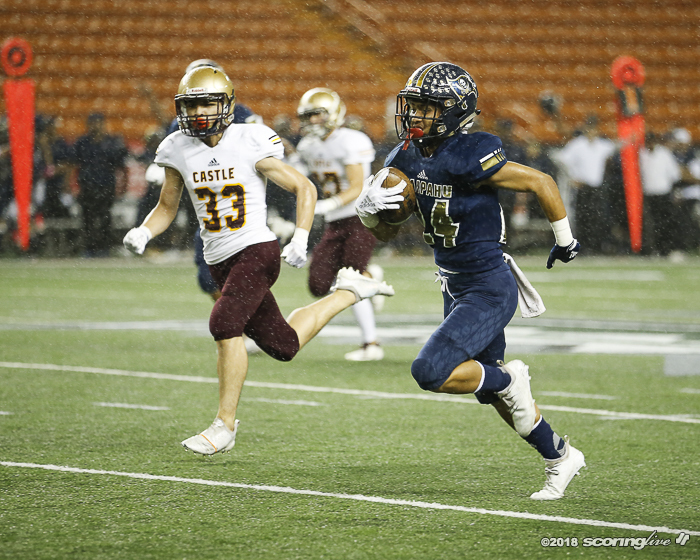 Nicholas Saragosa recovered a muffed punt and Castle marched downfield all the way to the Waipahu 5. 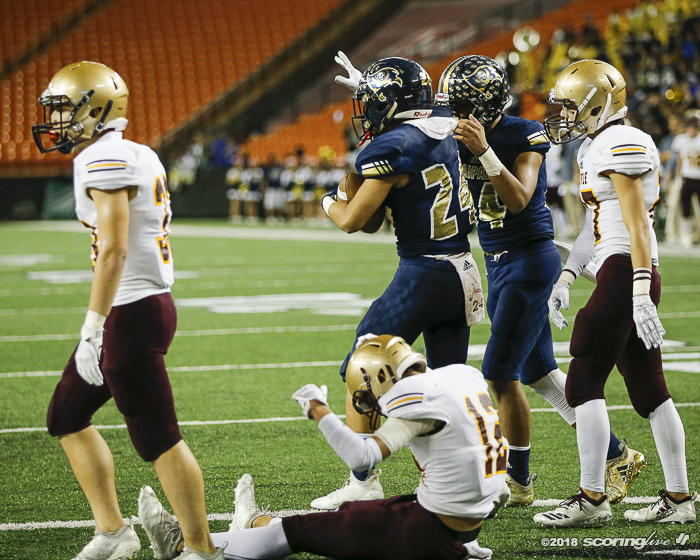 The Marauders were called on an encroachment penalty on Cheyden Costa's 22-yard field goal attempt, but on the next play, Waipahu stuffed Keanu Tilton to force a turn over on downs. 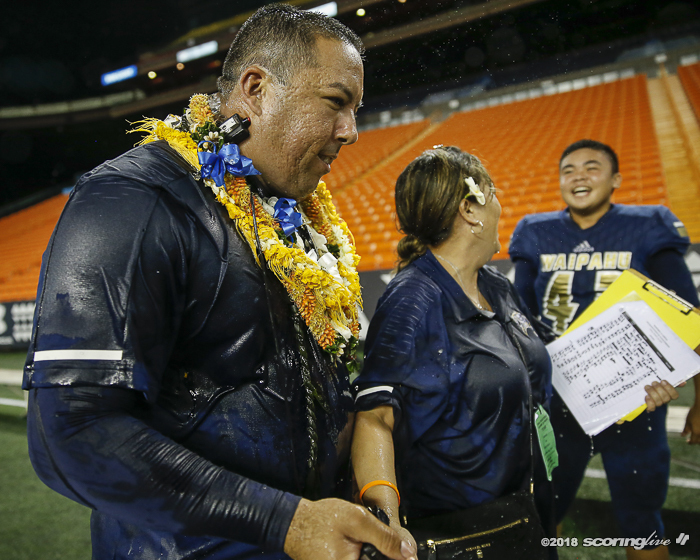 "Offensively we didn't execute. 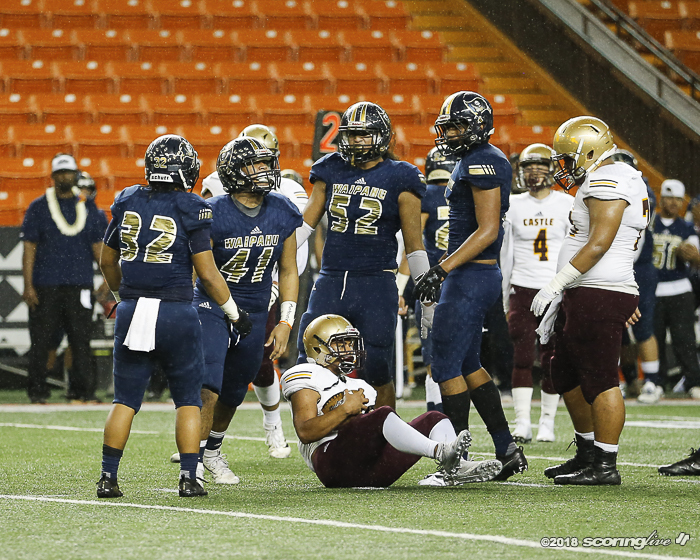 Our defense did pretty good in the first half and we made many mistakes in the first half and it hurt the team. 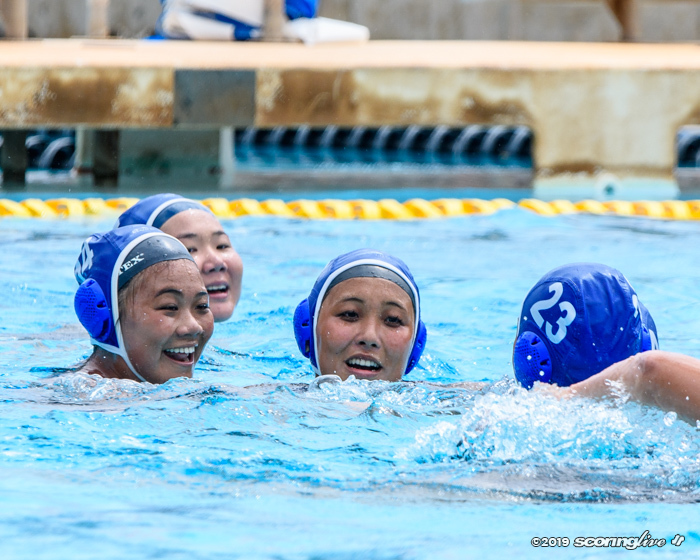 We have to be able to keep our kids focused so it stays in order every series," Hao said. 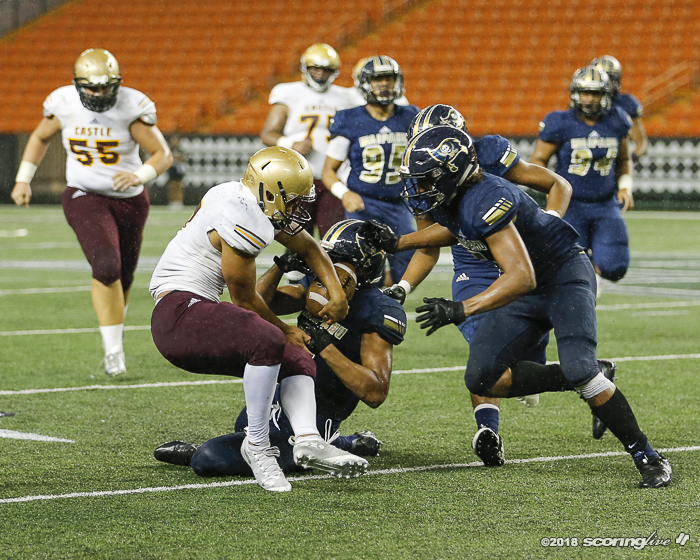 The Marauders defense added another touchdown as Kealii Barrett knocked the ball out of Punivai's hands and Manuele Pulusila scooped up the fumble and returned it 30 yards. 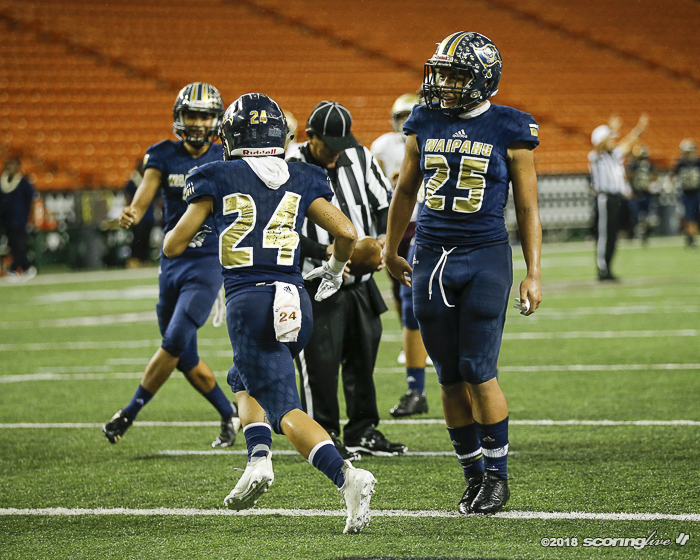 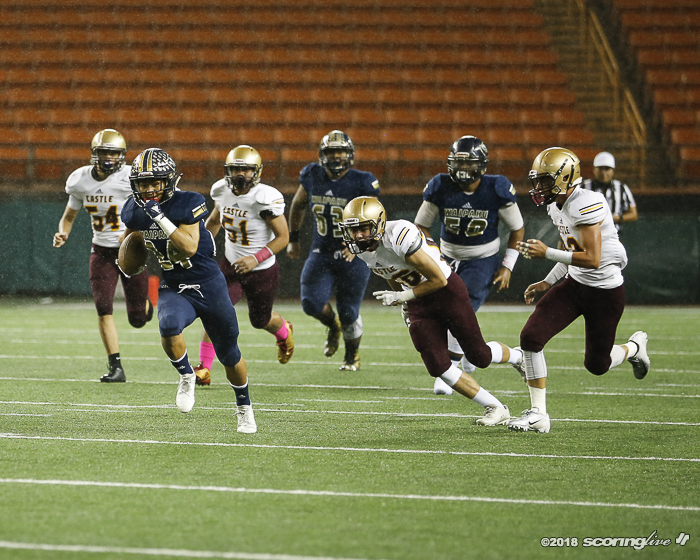 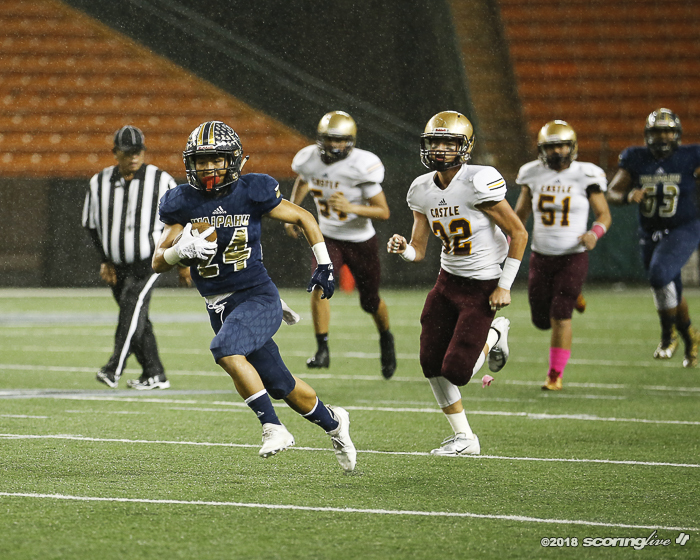 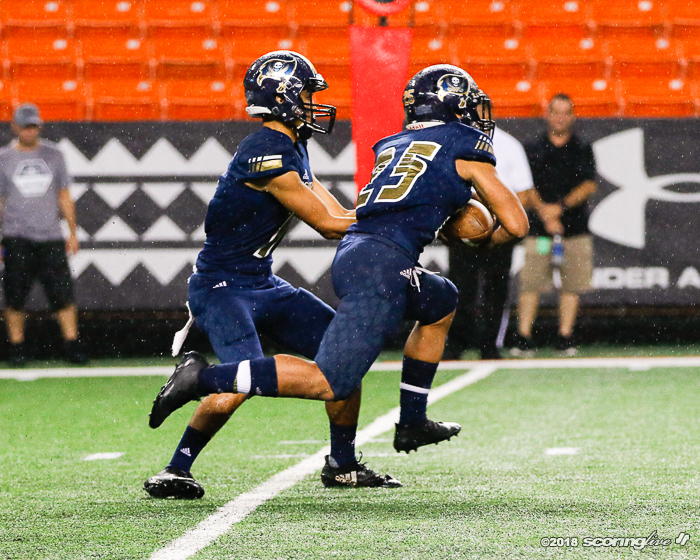 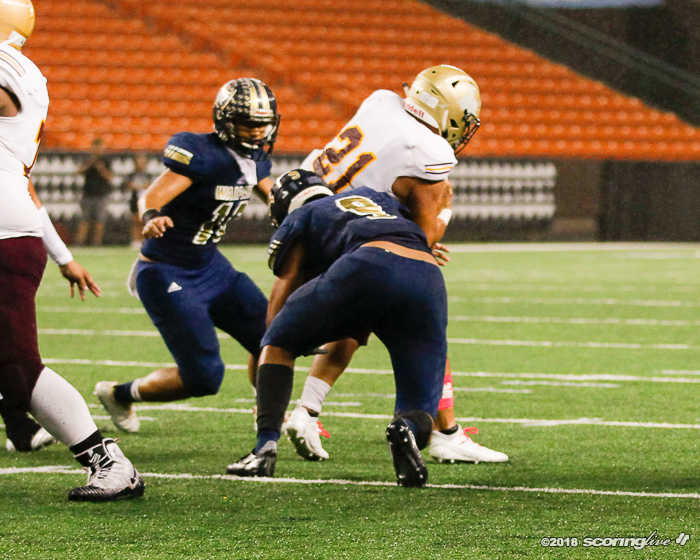 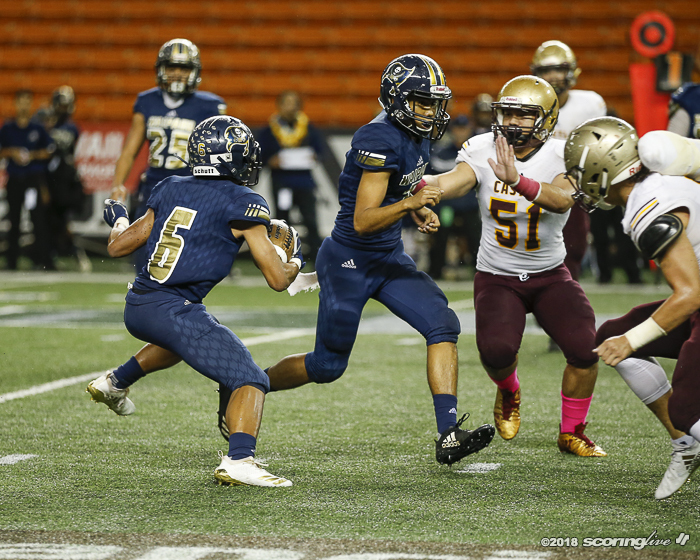 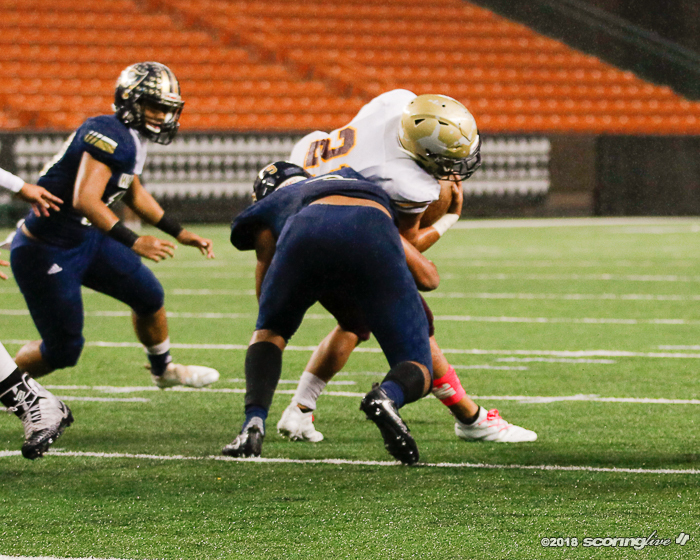 The two-point run failed as Waipahu led 12-0. 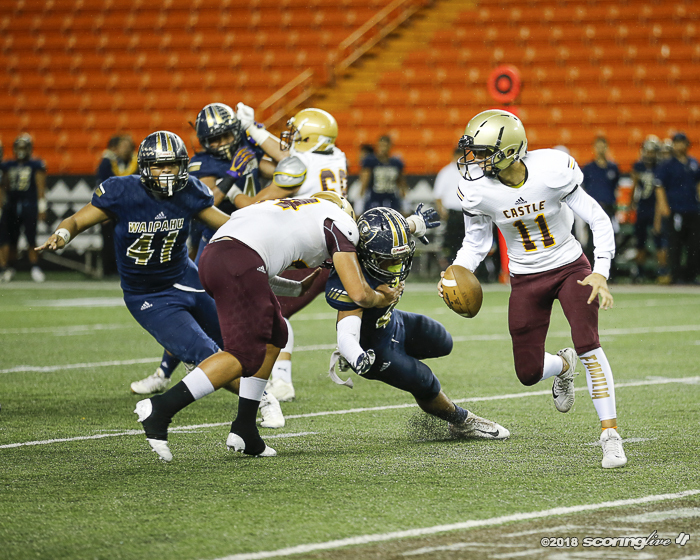 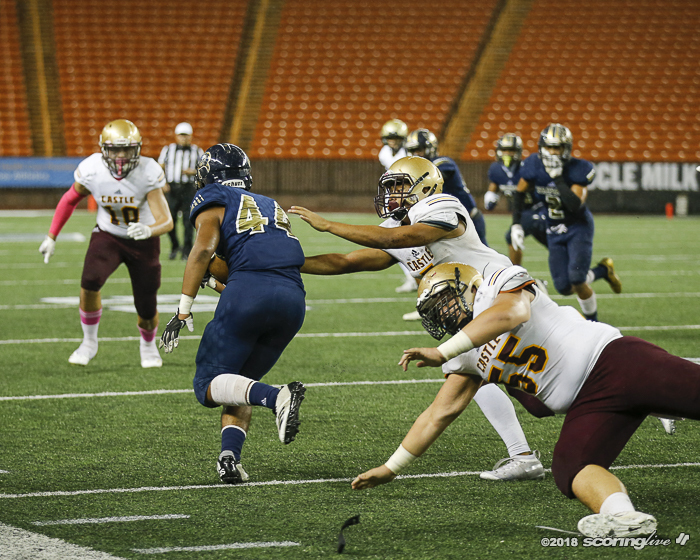 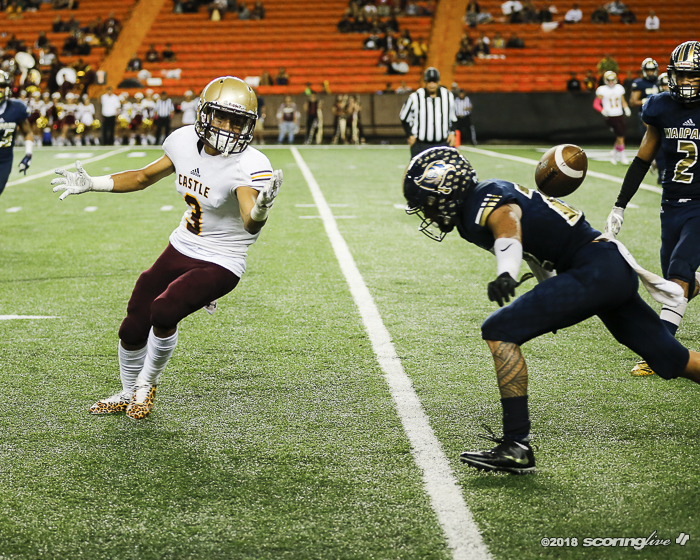 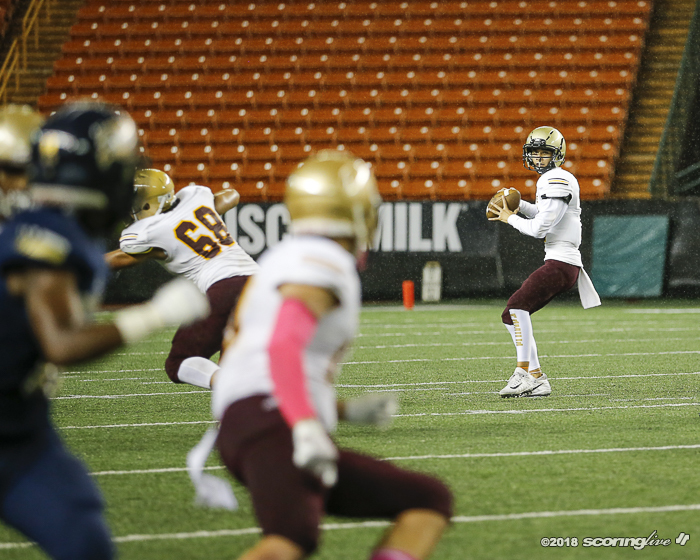 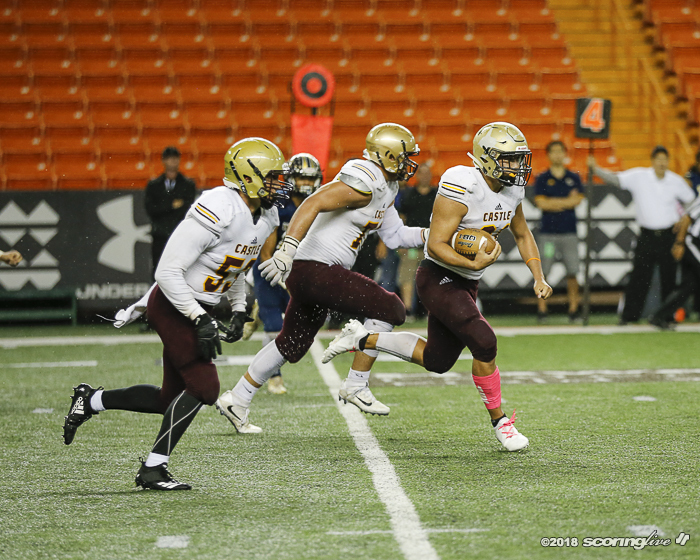 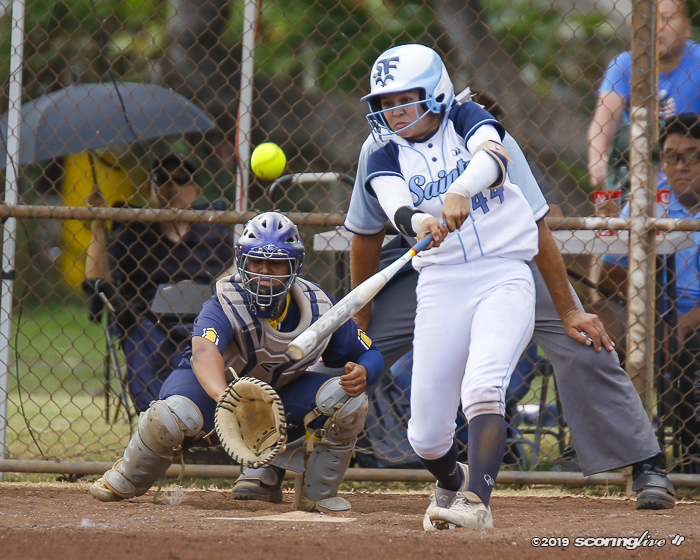 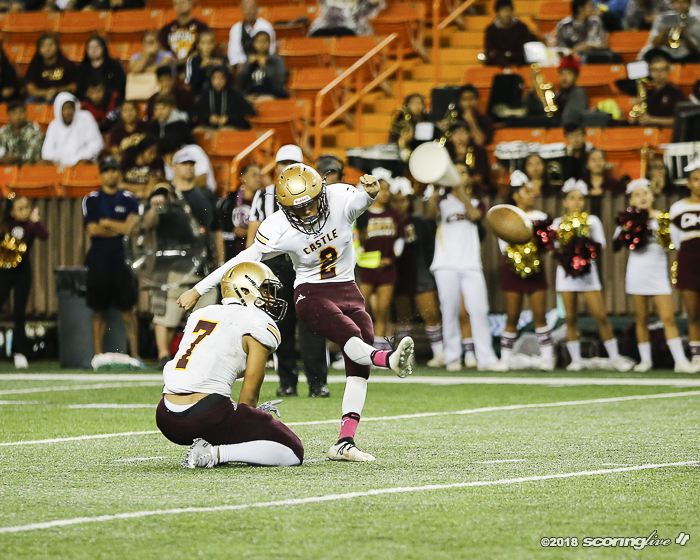 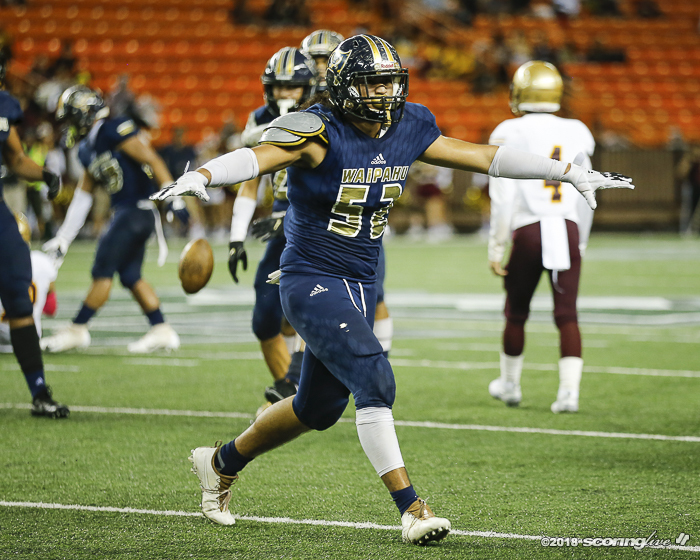 Kainalu Keliikuli-Grace recovered a bad handoff exchange and the Knights were aided by personal foul penalties to get into Marauders territory. 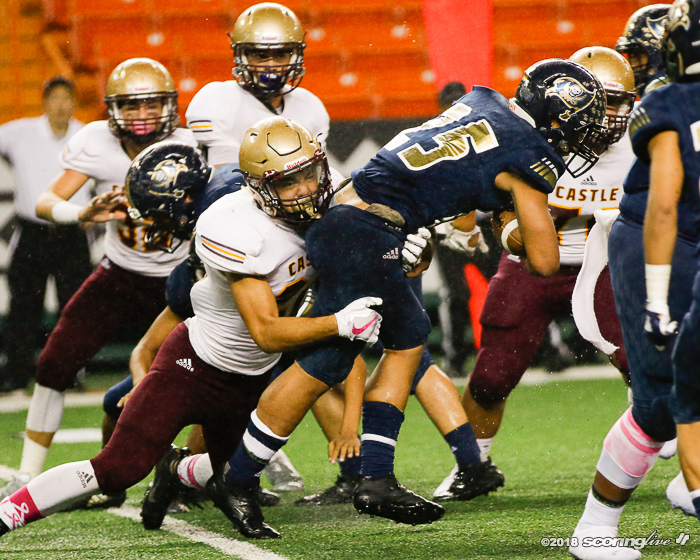 Castle settled for Costa's 22-yard field goal before the half for its only points of the game. 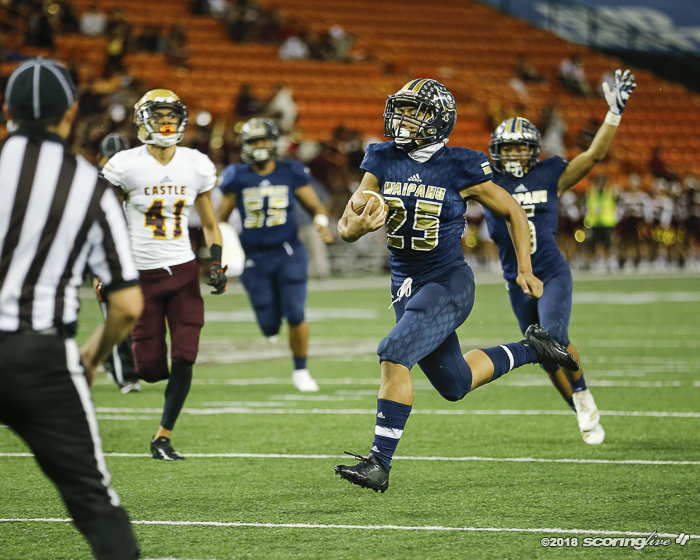 Waipahu pulled away for good in the second half as Failauga ripped off two touchdown runs of 27 and 58 yards to give the Marauders a comfortable lead. 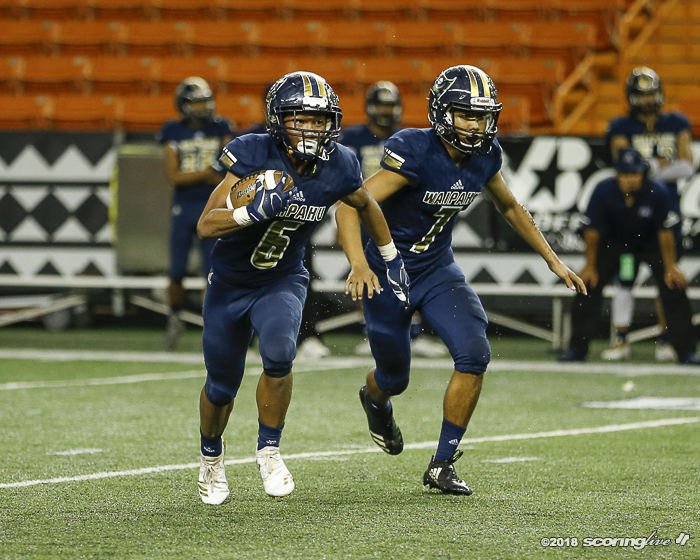 "The first half was a struggle, but I'd like to give a shoutout to my offensive line and the wide receivers being a decoy for the defense. 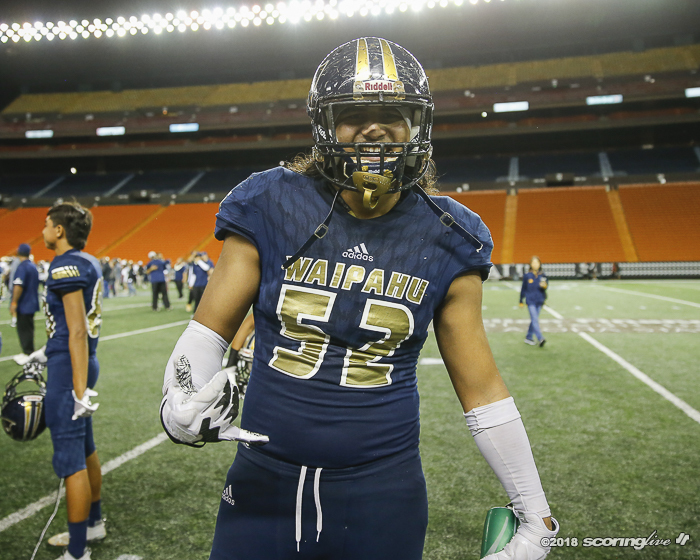 Eventually we came out with a 'W,'" Failauga said. 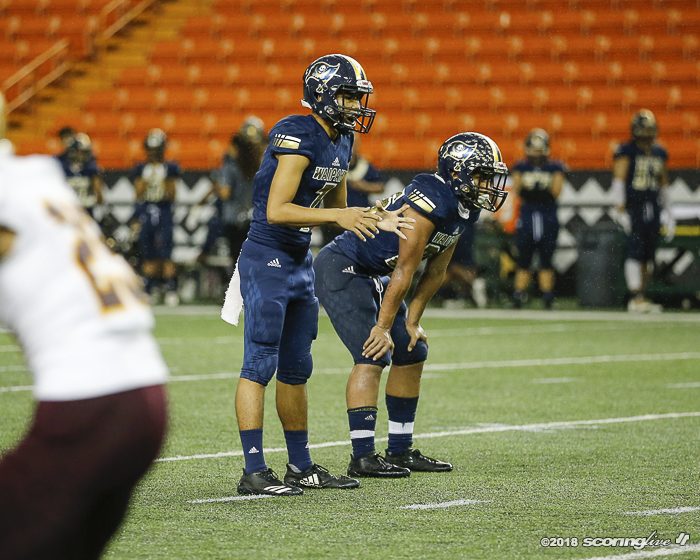 Marques threw his second and final touchdown pass from 15 yards to Reyes midway in the fourth quarter. 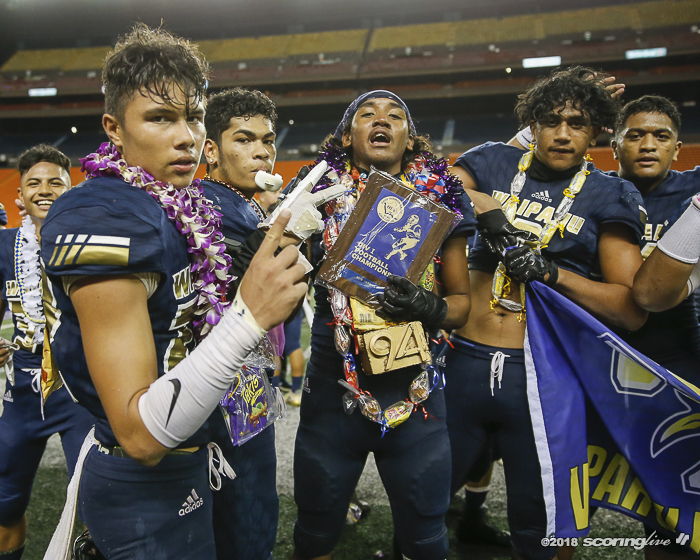 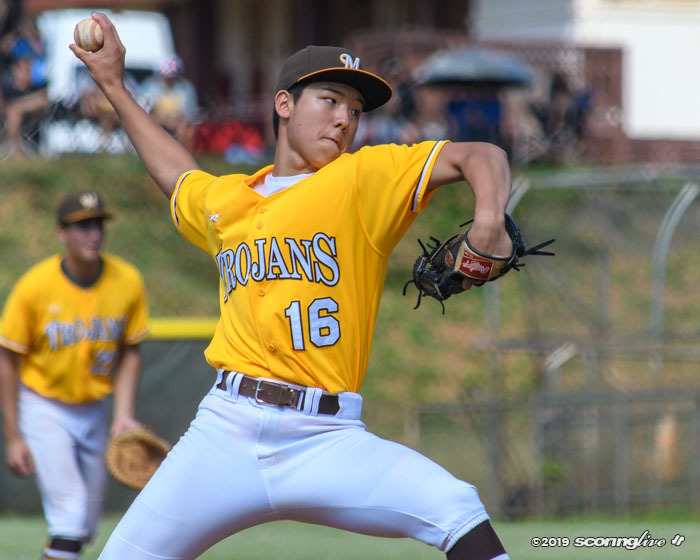 Knights were seeking their first OIA title since 2002. 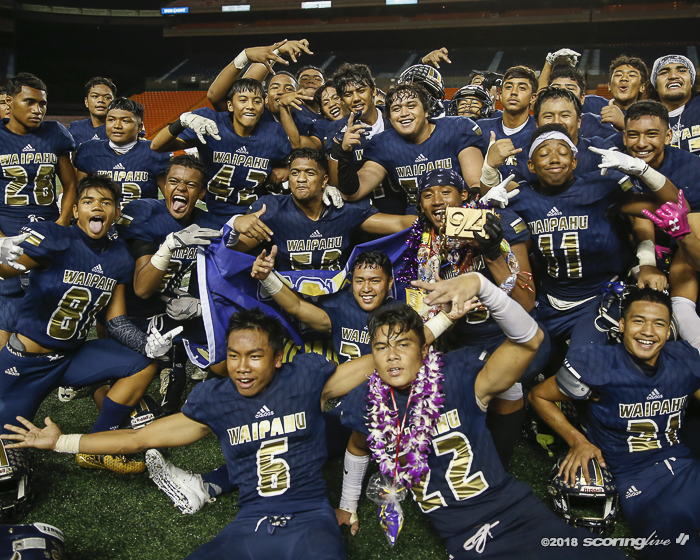 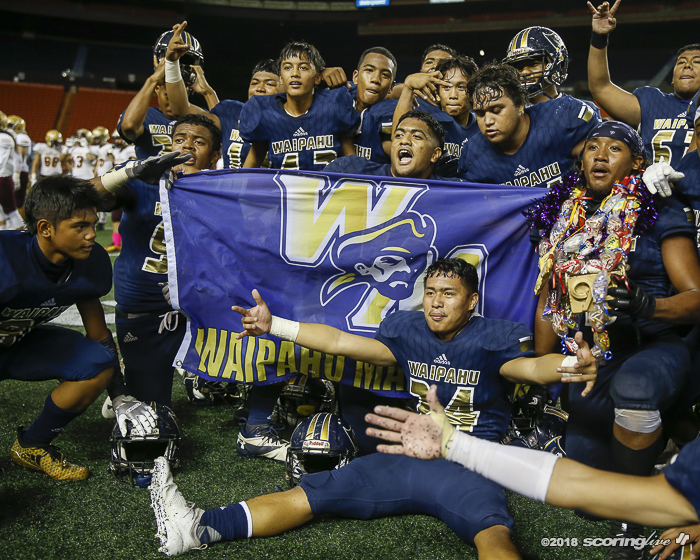 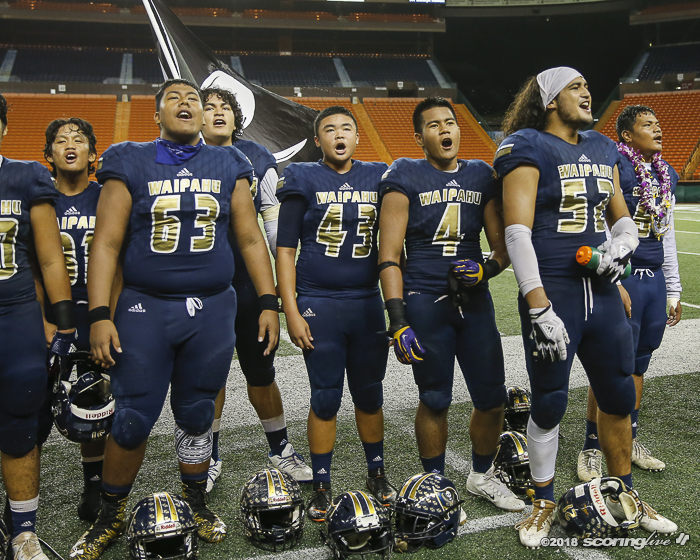 Waipahu won OIA titles in 1946, 1948-1951, 1957-1958, 1971, and D2 titles in 2006, 2011 and 2017.